This past summer was a beehive of activities and it was made a huge success by certain individuals who made a collective difference. My aunt Esther has come out again and done us all happy and proud by adding two more kids to her name. So apart from Peter Katana, Muthoka Muendi and Mugambi Kariuki, she is also sponsoring Emmanuel John and Muthini Kaveke. Amazing. 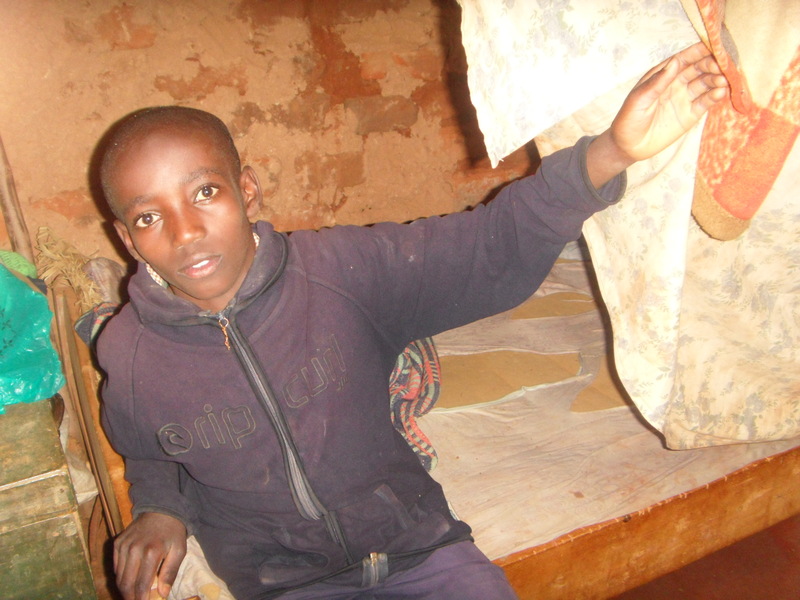 Emmanuel Maundu John is 12 years old, his exact date of birth is not known. He is in standard 5 and in his last exam, he was position 2 out of 47 kids in his class. His mother passed away in 2008 and his father in 2009, both from malaria. His elder brother who is 18 years old is in mechanical school, leaving the second born, 15 year old Kalekye as the head of the family. She did her National Exam for Class 8 last year but is unable to continue to high school due to lack of fees. However, a sponsor has come forward and has paid for her to undergo a specialized training course. They also live with 13 year old Mwende who is in Class 8, 10 year old Vaati who is in Class 5, 8 year old Muthama who is in Class 1 and 5 year old Katiwa who is in Nursery. Kalekye fetches firewood and water which she sells to her neighbours to get money to sustain the family. Sometimes well wishers or the church help her out. On their 1 acre piece of land, they plant maize, beans, pigeon peas and cow peas. They also have 3 goats and 4 hens. The children are getting great hostility from some of their relatives who claim their late parents bought the land and there was a balance left which they didn’t clear. They want to resell the land so that they can get the balance, although in the real sense, it’s the relatives who want the land. Should it be sold, the children will be left homeless. According to neighbours, the children are very hardworking and looking at them, you would not know they are orphans. They do not pity themselves and support each other to make the best of their situation. Kalekye also told us that should a sponsor come forward to pay her high school fees, she would continue with her education. They live in a mud and iron sheet roofed house that is just a single room. All the children sleep there, with 4 of them in one bed. It has a mattress and 2 blankets and 2 bedsheets but they are all old, dirty and torn. Muthini Kaveke Katuu was born on 13th May, 1998 and is 11 years old. He is in standard 4 and in his previous exam, he was position 5 out of 30 students in his class with a total of 477 marks out of the possible 600 marks. His mother passed away on 19th July, 1998 from gastroenteritis, when he was barely 2 months old. Muthini lives with is 28 year old brother, his 25 year old wife and their 2 children and their elderly grandmother. They have a 1 acre piece of land on which they plant maize and beans. They also have 1 cow, 5 chicken and 1 sheep. His brother earns $ 33 per month on which he supports his family and brother. 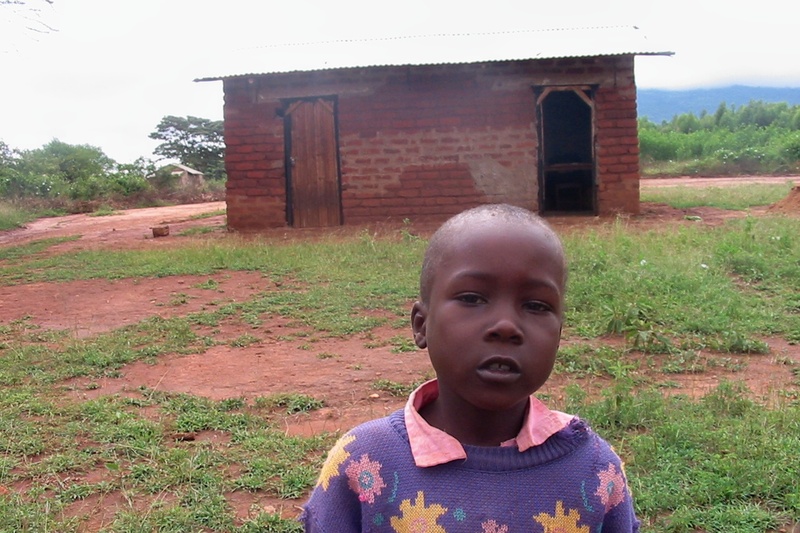 Their house is made of brick and iron sheets and Muthini sleeps on a bed with his grandmother. They have old beddings and a torn mattress. He suffers from an ear problem and stomach problems. Syombua Mueni was born on 20th December, 2000 and is 9 years old. Her mother passed away in 2005 and she was not married. She is in standard 4 and in her last exams, she was position 22 out of 50 kids in her class. She lives with her 63+ year old grandmother. 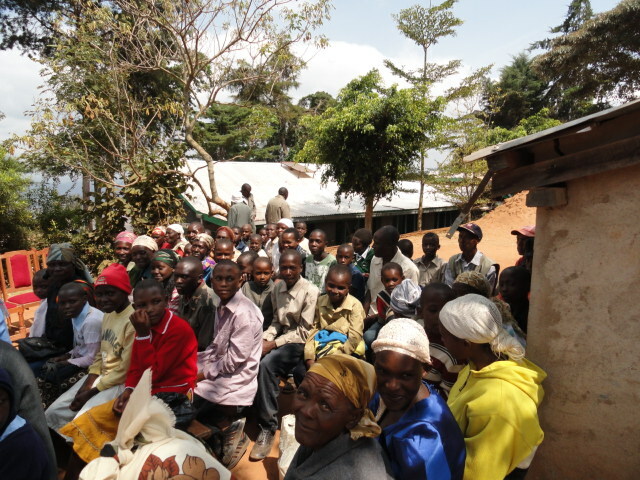 On their 1 acre piece of land, they plant maize, beans, millet and cowpeas. She also has 2 goats. She earns about $7 a month from farming, livestock and weaving baskets. They live in a brick and iron sheet house. Syombua shares a bed with her grandmother. They have a torn mattress and dirty blanket. Her wish list, which included a school uniform, beddings, bed, clothes, education, food, mattress and a school bag was fulfilled by Kathy Kay’s class. After doing this, Kathy Kay later sent an email requesting to sponsor Syombua. Thank you Kathy! Mutuku Mueni is 8 years old. His exact date of birth is not known. He lives with his uncle, aunt and their 2 children. He is in standard 1 and in his last exam, he was position 54 out of 61 kids in his class. His mother passed away in 2004, after battling a sickness for 3 ½ years. 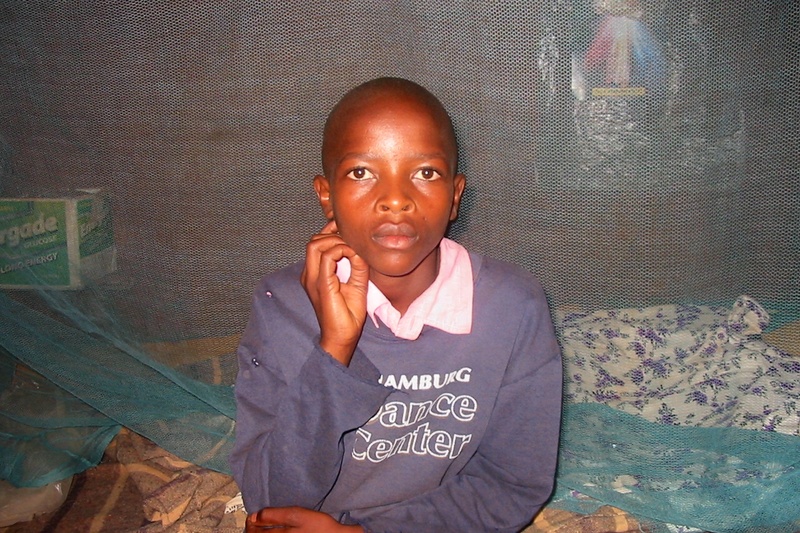 Her elder brother (Mutuku’s uncle), was the one who took care of her treatment with the little money he could spare. She was not married. There is a lot of rivalry within the family about the division of the land. The first wife (his step-grandmother) does not want the family of the second wife (his maternal grandmother) to inherit any of the land and they fear that if the grandfather passes away before the land is divided, their portion will be stolen from them and they will be chased away. The step-grandmother doesn’t like Mutuku and she has even made threats upon his life. On their 1 acre piece of land, they plant maize, beans, cowpeas and pigeon peas. The uncle earns an income from tilling other people’s land. They live in a brick and iron sheet house. 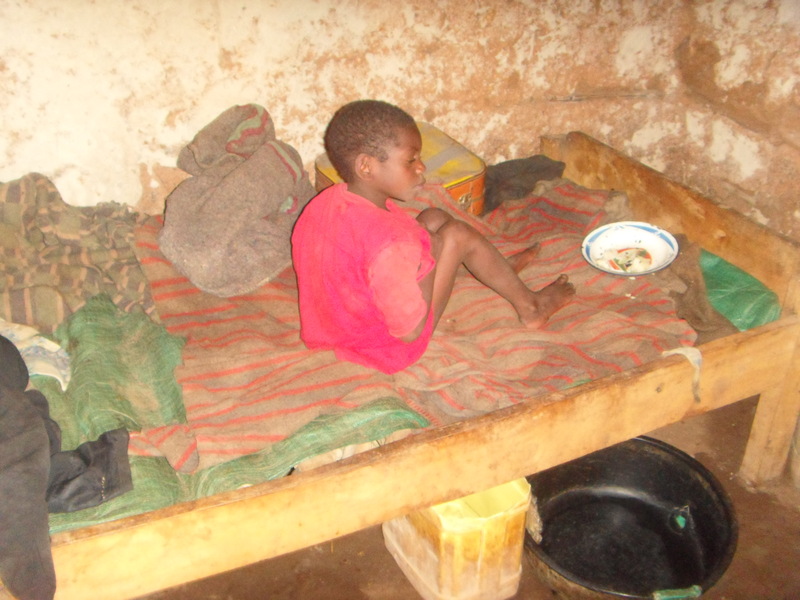 Mutuku sleeps on the ground with an old torn mattress and uses clothes and an old blanket to cover himself with. Mutuku doesn’t seem healthy. He has light red hair – a sign of malnutrition -, a skin rash and he coughs frequently. The aunt confessed that she had not taken him to the hospital due to lack to money. Mutuku Ngumbi is 11 years old. His exact date of birth is not known. He lives with his 71 year old grandmother. He is in standard 5 and in his last exam, he was position 8 out of 30 kids in his class. His mother passed away in 2000, a year after he was born. She was not married. His grandmother earns an income through selling extra farm produce, begging doing casual work where she can get. On their ¼ acre piece of land, she grows maize, beans, peas, sugarcanes and bananas. They also have 1 goat and 1 hen. Mutuku sleeps on a weak and poorly constructed wooden bed alone. He uses sacks stuffed with napier grass as his mattress and his beddings are old and dirty. He looks thin and malnourished. 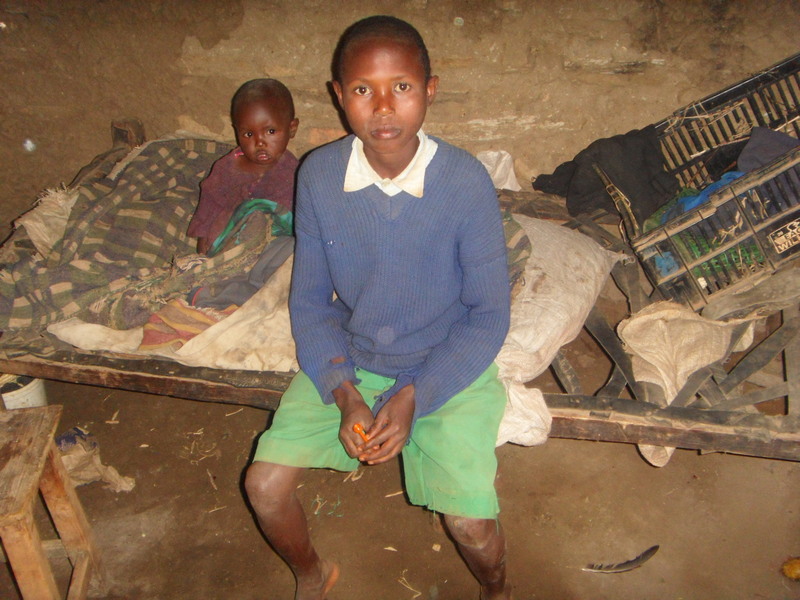 Muthama Mulei was born in 2002 and is 8 years old but not yet in school. He is mentally challenged and may not be able to join a mainstream school, although he needs a lot of love and care. He lives with his 61 year old aunt, his standard (grade) 6 sister and a mentally challenged brother. The mother passed away in 2003 from typhoid and the father in 2006 from T.B. (tuberculosis). On their ¼ acre piece of land they grow maize, beans and bananas and they have 1 sheep. The aunt’s children chip in financially when need be but it is still not enough, they live from hand to mouth. 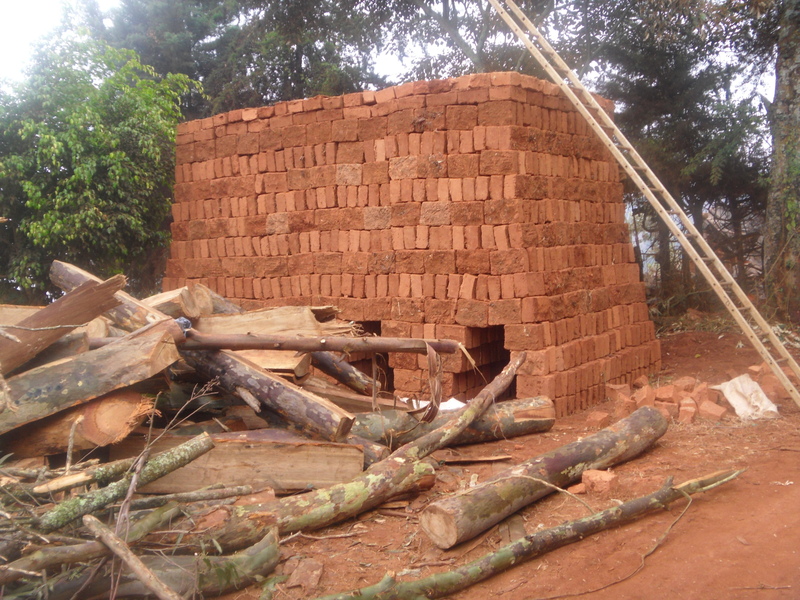 The house is made of mud and iron sheets and Muthama shares a bed with his brother. They have a torn mattress and a dirty blanket for beddings. He is not healthy looking, his feet have been attacked by jiggers to the point that he cannot walk well. Emma Mwikali is 7 years old. Her exact date of birth is unknown. She is in standard 1 and in her last exam, she was position 34 out of 44 kids in her class. Her mother passed away on the 18th of January this year, at the age of 47. She died due to Tuberculosis (T.B.). Emma lives with her 61 year old grandmother and her 2 older sisters. On their 1 acre piece of land, they grow maize, beans and millet. Emma’s grandmother earns $ 5 on a good month from farming. Their house is made of mud with iron sheet roofing. Emma shares a bed with her grandmother and 1 of her sisters. They have old beddings and an old mattress. She suffers from ringworms and body rashes. 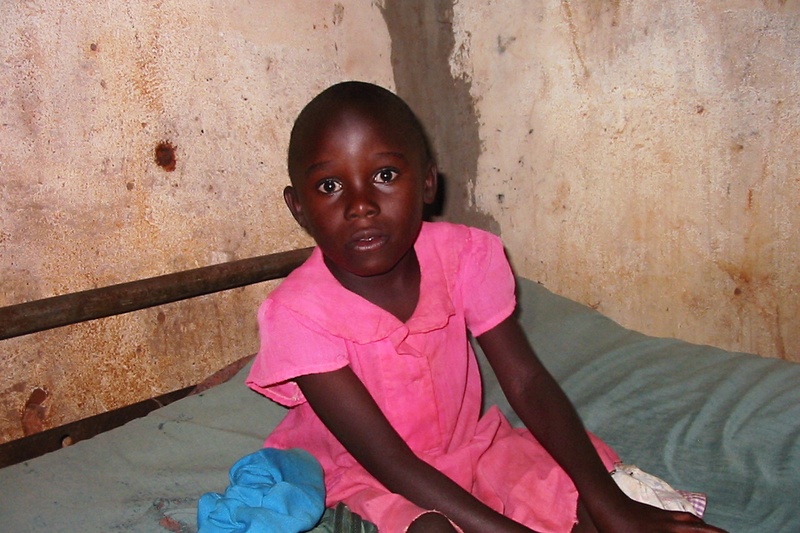 Her wish list includes a school uniform, clothes, bedding, a bed, education, food, stationery and textbooks. This was fulfilled by Fred Dawber. Mbula Ndunge was born on 14th December, 2004 and is 5 years old. She is in nursery. Her mother passed away in 2004 from asthma and typhoid. She lives with her 42 year old grandmother, 4 cousins and 2 uncles that are deaf and dumb. On their ½ acre piece of land, they plant beans and maize. They also have 1 cow and 2 goats. 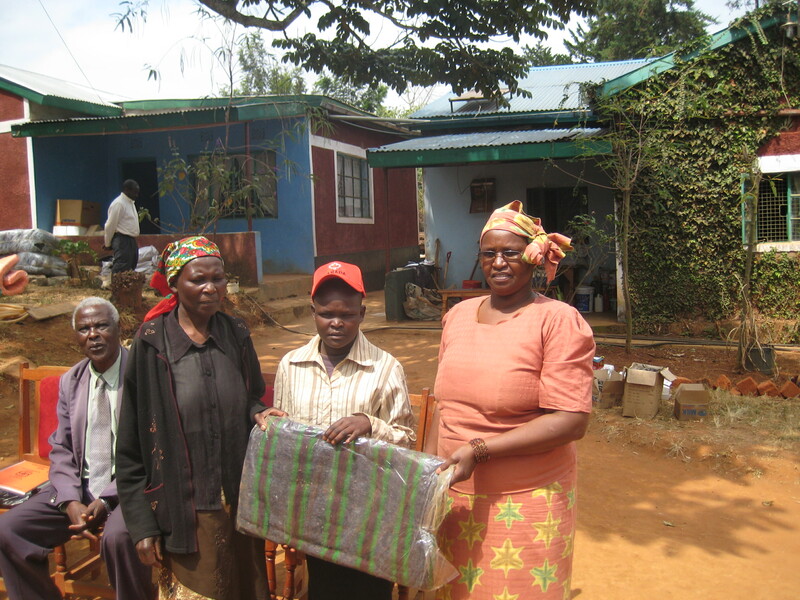 On a good month, the grandmother earns about $ 20 from farming and livestock. She sometimes gets support from relatives. Mbula shares a bed with her grandmother and 1 of her cousins. They have a torn mattress and 1 blanket. Mwongeli Mumbua was born on 10th May, 2006. She is 3 years old and not yet in school. Her mother was not married and she passed away on 10th June 2009 from an illness. She lives with her 60+ year old great grandfather, 46 year old great grandmother and her aunt. On their 1 acre piece of land, they grow maize, beans and peas. They have no livestock as they all died during the last drought the country experienced. They earn a living through burning and selling charcoal and casual labour. Their house is made of brick and iron sheet roof. Mwongeli sleeps with her great grandmother and her aunt. They use sacks as a mattress and they have old tattered sheets and blankets. Mwongeli also suffers from ringworms. Her wish list includes school fees ($48 for the whole year), stationery, uniform, clothes, beddings, bed, medical care and shelter. 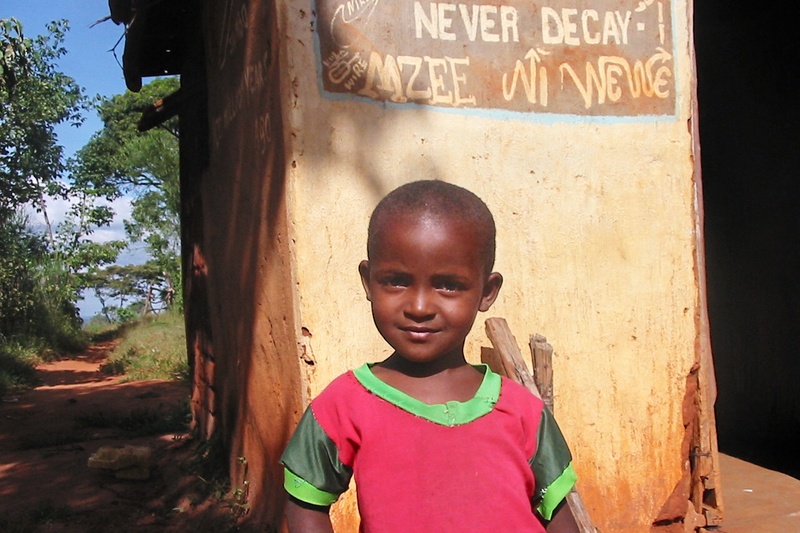 She had been initially enrolled into nursery school but later dropped out due to lack of school fees. This can be fulfilled with a donation of $130. Fred and his daughter Kate Dawber, apart from fulfilling Emma Mwikali’s wishlist, also provided the wishlists of 5 other kids! Mutuku Ngumbi, Mbula Ndunge, Mutuku Mueni, Mwau Mumbua and Muthini Katuu are very happy kids thanks to this outstanding family. 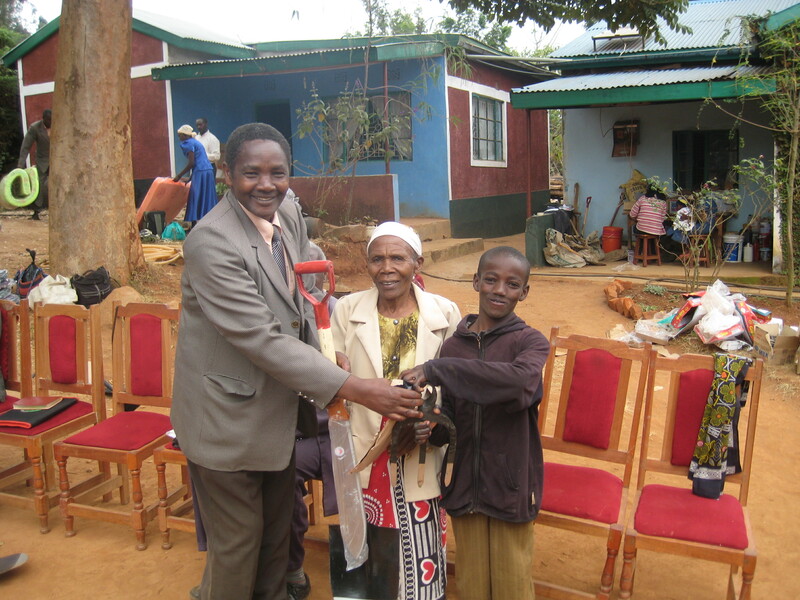 Anita and Eric Walters granted Mwongeli Syokau’s wishlist in memory of Denis Malcolm. Muthama Mueli’s wishlist was granted by Shelly Hladki and Nzisa Wayua’s wishlist was granted by Karen. Due to all these combined efforts, we managed to fulfill all the wishlists currently on the website, leaving just 4 more kids for sponsorship. 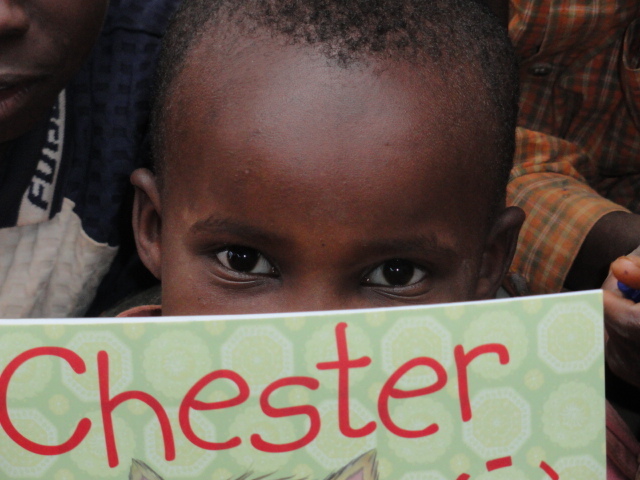 And just to remind all of us of how far we have come, we have a total of 74 sponsored children! As I sit down to right this update I’m using my new computer. This was not a choice but something forced upon me by the total ‘meltdown’ of my old computer – a motherboard failure that rendered it useless. Thanks to the tireless work of Mohammed at DuraPC Computers, the data was saved, recovered and then I was able to utilize almost all of what was there. Without this sounding like an advertisement – if you need to find somebody honest, with integrity, to take care of your computers in the Mississauga area – he’s the guy. 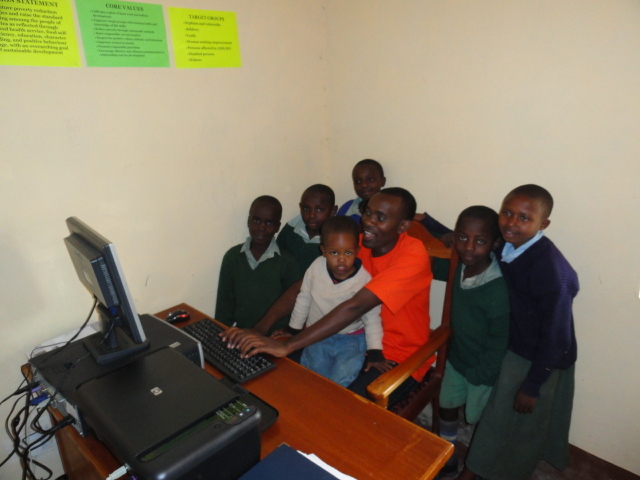 One further note – one of the computers we brought with us to Kenya for Rolling Hills – was purchased from Mohammed at cost. He continues to be a great friend of the program in Kenya. 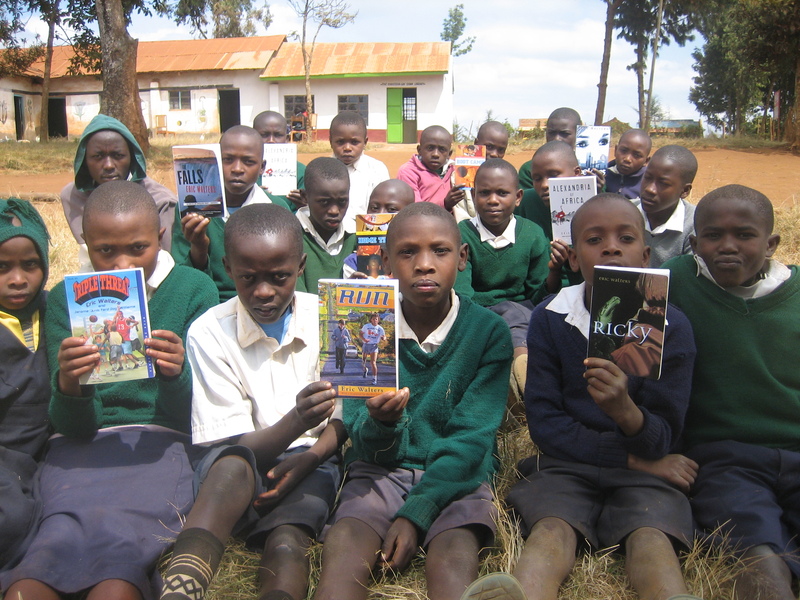 As with the past three summers I again travelled to Kikima Kenya. This time I was accompanied by my youngest daughter, Julia, her close friend Megan, and we met there a friend of the program, Donna Michelle St. Bernard (a.k.a. Belladonna) who was in Africa already, exploring, experiencing and writing. As always, all parts of each person’s travel costs and expenses while in Kenya was covered completely by their own funds. Never does one cent from fund raising go to pay anybody’s expenses. Below is a letter from Julia talking about her experiences and their impact on her. On July 18th my father, my best friend Megan and I started our journey to Kenya, a country filled with beautiful people and beautiful culture. This was my second time to Kenya, and just as during our first trip, we were greeted with overwhelming love by the Kyatha family. We began our trip by spending a couple days in Nairobi, doing the typical touristy things where trinkets were bought, photos with giraffes were taken and pizza was eaten. As much as I enjoyed my time in Nairobi that is not the Kenya I love. The Kenya I love is the rugged hills of Kikima where the roads are not paved, there are no tourist attractions and you cannot find a pizza place no matter how hard you try. Kikma has rooted itself into my heart and I guarantee as long as I live part of my soul will be in Kikima. During the ten days in the village I was lucky enough to get to know the children you love and support and words cannot explain how amazing each child is. The thing that amazes me is that every kid has a story that will break your heart, and yet they stand up tall with courage and love in their hearts and they are not bitter about their pasts but rather, are hopeful about their futures. These children taught me so much and I cannot thank them enough for what they have done to change my life, who I am and who I will become. While I was in Kikima I was always doing something, whether it was visiting water projects or teaching at the local school. I was always meeting new people and was welcomed into the community with an overwhelming feeling of love. I have so many stories I would like to tell, and so many memories I would like to share but clearly it is impossible to share them all, so I will tell you my favorite moment of the trip. This was an act of kindness, and to some it might seem not important but to me this memory means the world. 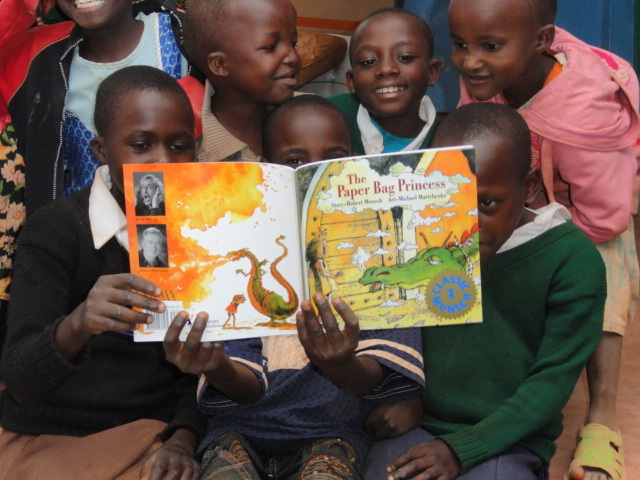 I was teaching at the Kyanjoma Primary School, the local school in Kikima where all the kids from the home attend. I was given the opportunity to teach grade five social studies and to work in the nursery where yet again I met more amazing kids. While teaching nursery we brought the little ones out to the grass for snack time. Some brought out left over dinner wrapped in paper or plastic bags, some had rice, some had nothing and one tiny little girl had an orange. As I was sitting with the kids I felt a tap on my shoulder and standing behind me was the tiny girl, extending her hand to me offering me a piece of her orange. The little girl then went around her class handing out pieces of her orange to those who didn’t have a snack. That’s my story, and if everyone in this world could be as pure and selfless as that little girl the world would be a much better place. My life is so blessed and I have so many things to be thankful for and out of everything in my life, this trip was my biggest blessing. I thank you for reading this, and thank you for letting me share what I could put into words. The end of June saw a flood of money coming in. Let’s start with money coming from outside of Ontario. Medicine Hat High School, Medicine Hat Alberta, raised $231.38. Below is a letter from organizer, Rhonda Hunter. Our school enjoyed your visit back in the fall of 2009, and we appreciated learning about The Creation of Hope. We raised money, which we affectionately called “Goat Money”, for this project. Two of our Phys Ed Teacher, Grant Schaber and Quinn Skelton were especially helpful in this effort. Please accept these funds from the students of Medicine Hat High School for this worthwhile cause. I would also like to make you aware that Alexandria of Africa was voted best book of our annual Have You Read It Yet? reading initiative. Also, Branded has been chosen as one of the top ten books for the 2010/11 initiative. Thanks again for visiting our school. It is always a treat when students can see and hear one of their favourite authors. We have received unbelievable support from schools in Saskatchewan, Robert Southey – an additional donation of $3199.96, and Cupar, with an additional donation of $3532.27. While this has been spearheaded by a team of teachers in both schools there has to be special mention of the man behind it all, Michael Berg. 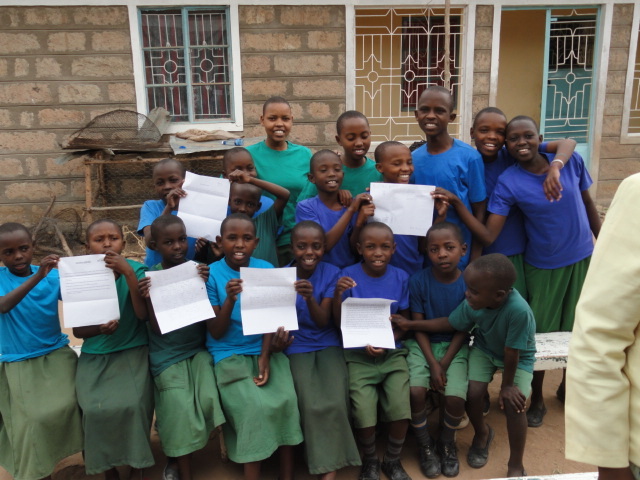 Here is a letter from Michael – describing what his very small school has been able to accomplish. Michael has, as always, downplayed his role. He is the sort of teacher and role-model we all wish we had for our children. 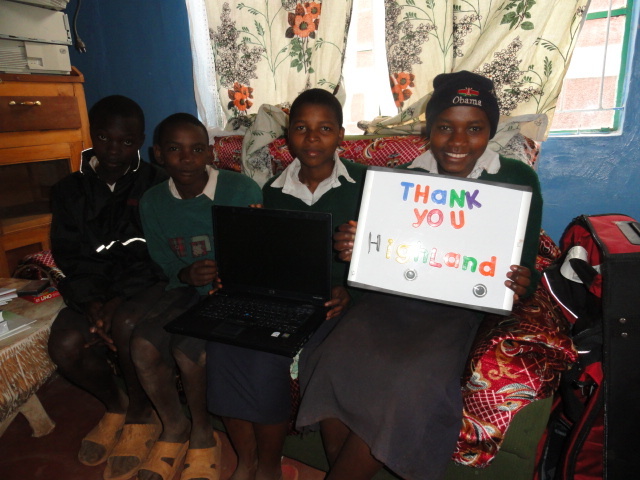 Michael, a huge thanks from me and the children of Kikima whose lives you have changed . . . although I suspect you’ve changed a lot of young lives in Saskatchewan as well! Well the year has come to an end and I wanted to give some background on our tiny school of Cupar Saskatchewan. We currently have only 180 students from K-12 and 18 staff members and when I introduced the idea of helping out The Creation of Hope literally all 180 students and staff jumped at the opportunity to help. We did Hot Lunch sales, we sold food at district and regional sporting events, we had hat and jean days, we had a penny race, we had personal donations from staff and students and parents, and we had ice cream sales, we had a community breakfast. The School community council and our MLA even donated time and funds to help the program. It was amazing to see the community come together and the positive response, from such a small school and community (Cupar is 650 people). It was an honor to be a part of it and I loved every minute. I live in Regina and Cupar is a 45 minute drive every day. Next year I have been transferred to Lumsden Elementary School which is only 10 minutes outside the city. I hope to continue the program but cannot guarantee to this extent since it is a new school for me. I also have included some funds from my wife (to be) and I. We have decided to do this as a wedding donation and feel honoured to be part of it. Southey and Cupar’s cheques are both enclosed with Cupar raising $5117.09 as a final total. I would like to thank you and Ruth for your time and dedication. 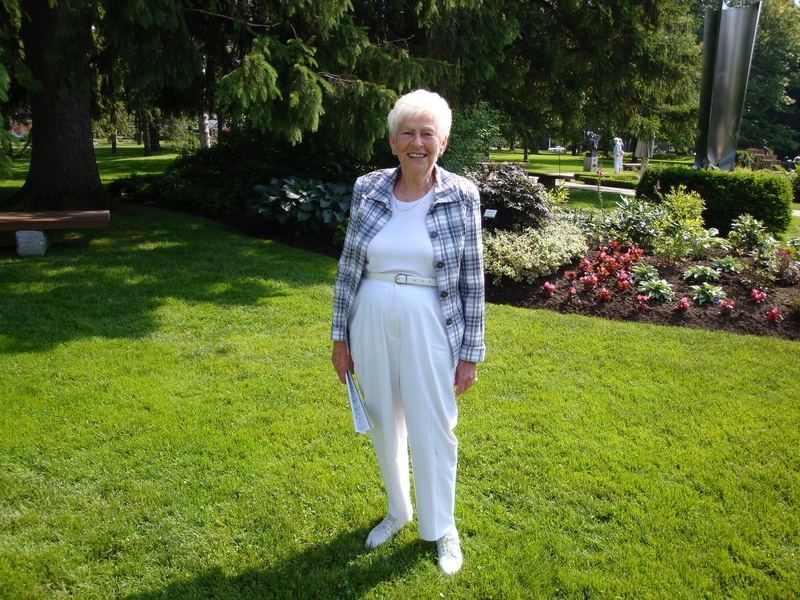 Sharon Freeman is our good friend from Burnaby B.C. She is an amazing teacher/administrator/librarian whose knowledge of children and young adult literature is staggering. She is also my host – offering her home and a car – when I travel to the Vancouver area. She has given $180.00 as a 35th birthday present for Rob, Al, Becky and Steph. Sharon has also worked with students in her school, Stride Avenue Community, to provide an additional $300.00 donation. ….And update from PWK High School in the Northwest Territories – including some pictures. I am emailing from PWK High School in the Northwest Territories where the brand new World Issues Club raised over $1500 for Creation of Hope last year. I sent the cheque to you in June but unfortunately with the craziness at school I haven’t gotten a chance to send you pictures until this new school year. I hope you can still post about our school in your website updates. The students in the club arevery proud that they were able to raise so much money and awareness in one year. The pictures I am attaching are of our Pie in the Face auction which was extremely successful and raised more than $1000! 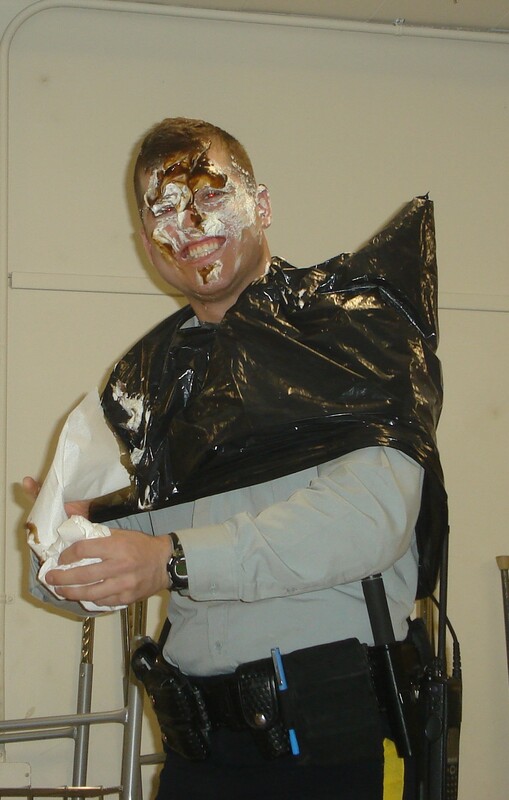 The local RCMP officers even showed up as surprise pie targets! Innisdale Secondary School is a school with both a heart and an active and extended student body passionate about social justice and international issues. The Social Justice group operating out of Innisdale have made an additional donation of $1165.56 on top of the money they have already raised. Thank you. Our revenue generally comes from two sources; schools and private donations (individual donations or ongoing sponsorship of a child). We now have a third source, which while based on individual donations, originates through business sources. The firm of Davies, Ward, Phillips and Vineberg held a casual day on July 30 and raised $422.30. Thank you so much, lawyers and their support staff, with hearts of gold! Fred Dawber – a man with a heart of gold – has again provided additional funds (in addition to those from his family which sponsors four children) for school supplies, water projects and wish lists for children. In addition he looked at the website and decided to provide funds for EVERY wish list for EVERY child! Marina Cohen made another donation to the program. Thanks Marina for your ongoing support. Going to Kikima every year I get to witness the changes. 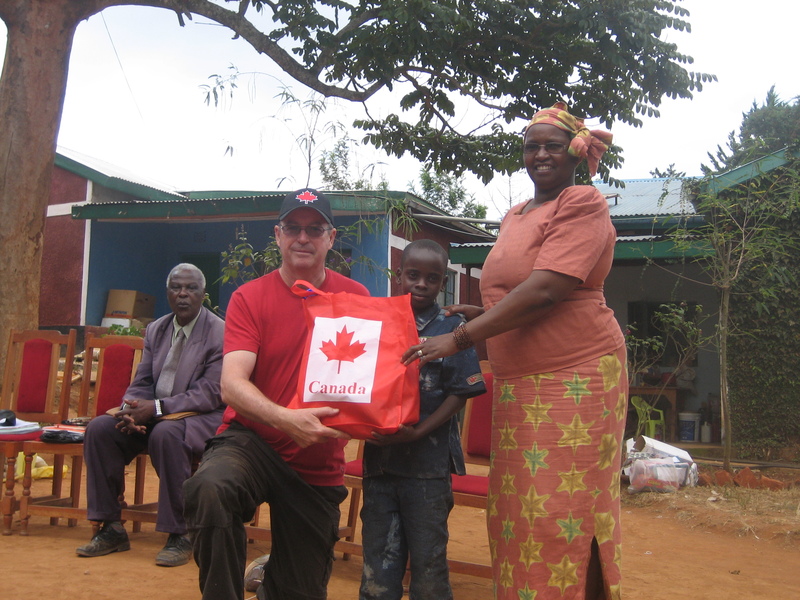 It is not exaggerating to say that lives are not just changed, but saved, that the community has been altered for the better by the partnership of caring people in Canada and the caring hard working people in Kenya. I was present for the official opening of The Christena Gay Community Library. This ceremony was attended by over five hundred people and included not only all the students of Kyangoma School but teachers, principals, church officials, and government officials from across Mbooni District. 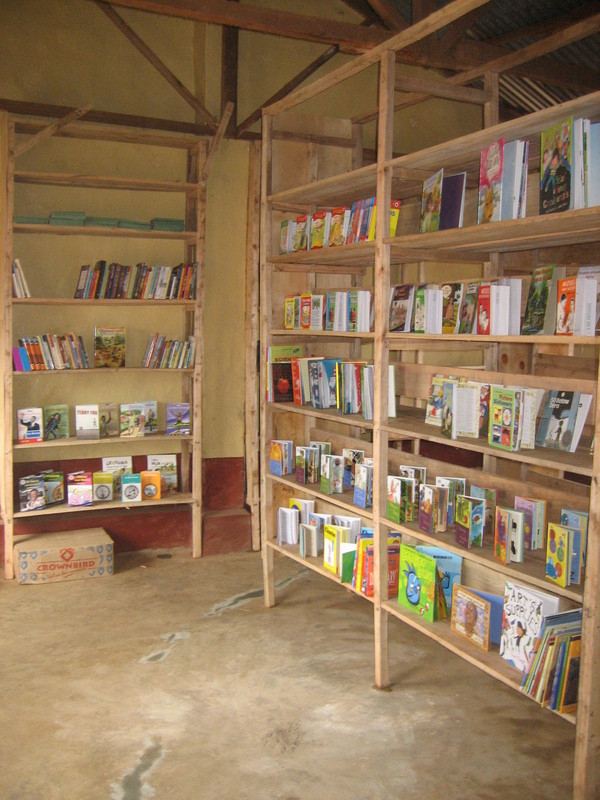 This is the first library – either school or public – in all of Mbooni district. The building, donated by the school, was refurbished, plastered, painted, and furnished with shelves, desks and a special counter for the teachers to use to check out books. 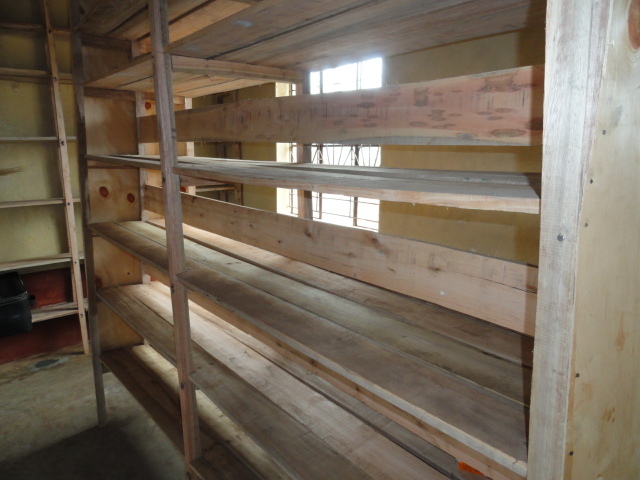 The shelves were filled with books that were purchased in Kenya in Swahili, Kikamba (the local language) and English. Children generally become tri-lingual at a very early age. As you can also see – SOME – of the shelves are full. We would like to fill them all. Often people are generously willing to donate books. Our problem is that shipping the books costs more than purchasing books there. 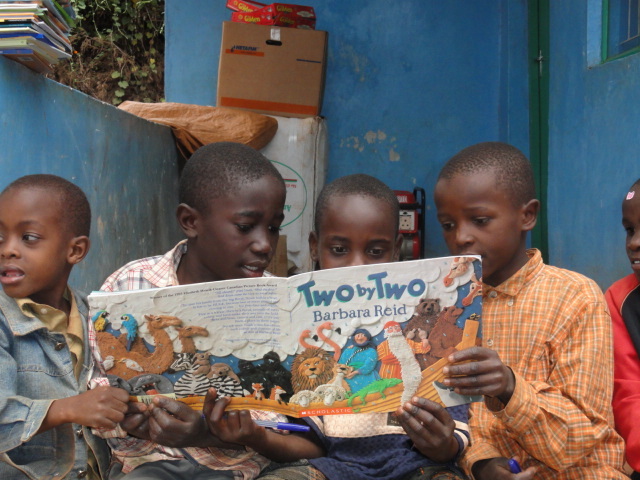 As well, it is very difficult to get books in either Swahili or Kikamba in Canada and we are working to make this a library reflective of the culture of Mbooni. Any donation to specifically purchase books would be gladly welcomed. In addition we purchased books and brought them from Canada. I admit to a slight bias, but there are so many great Canadian writers/illustrators and I wanted their books to be part of the library. I chose a selection of books that were not only my favourites but also offered a window into Canada. You might notice that the last picture features a collection of my books – I guess I have a bias there too and hope that can be excused. 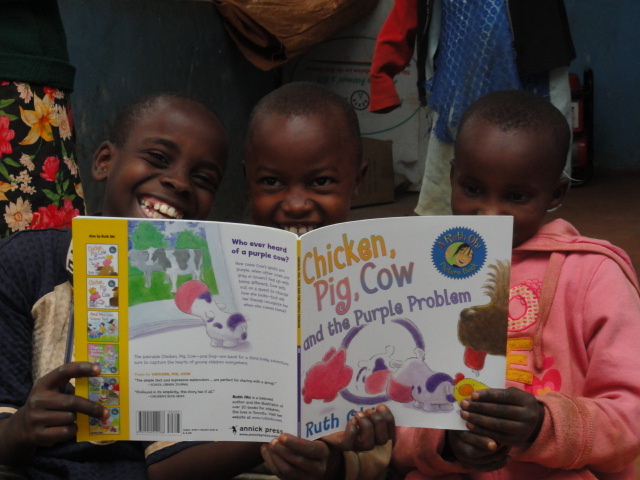 In addition to books that were purchased both in Canada and Kenya we also had some donations from Orca, Penguin and Doubleday. All offered many, many more books than we could transport. Transportation is even more expensive than purchasing books. As well we try to keep up an active commitment to buy locally wherever possible and to reflect the culture(s) of the community. There is also a very personal connection between the present in Kenya and my own past. Christena Gay – Miss Gay – is my grade 5 teacher. She was a remarkable teacher and remains a role model for me on how you should live your life. These two pictures, our grade 5 class and a picture of her now, are on the walls of the library. We had a contest at the school the day of the celebration. 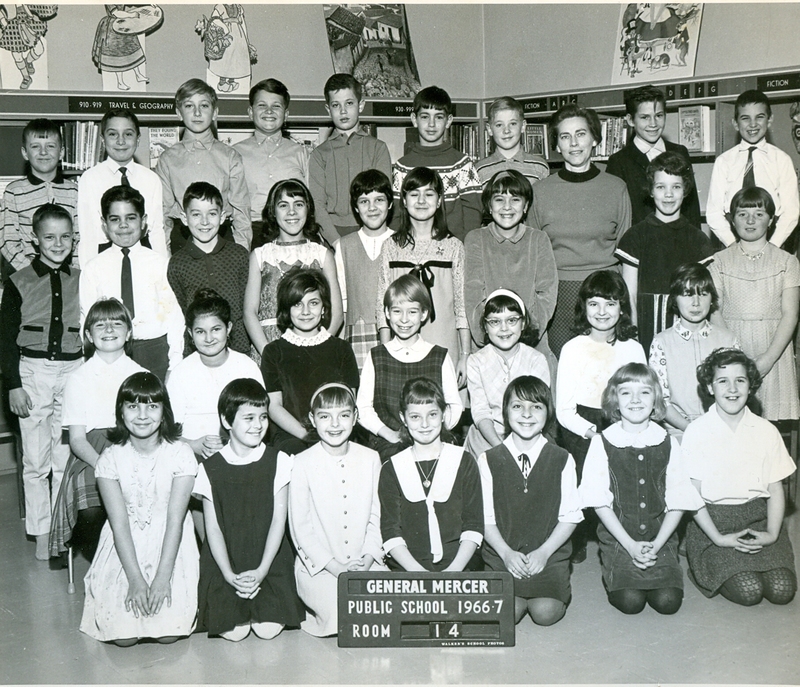 My grade 5 class picture and a present day picture were shown to the roughly 400 students who attend the school. They were asked to guess which one was me. Only three guessed right – included amongst the incorrect guesses were some who actually thought I was one of the girls in the picture! Those three winners were given 100 ksh as a prize. For those who are keeping score I’m the one . . . no I’m not telling. If you have a guess please email although I’m not offering ksh as a reward. Anybody who has read my book Ricky will also note that top row, third from the left, is my best buddy – and still good friend – Augie Levy. Below is something I wrote to explain why this library is named after this remarkable woman – my grade 5 teacher. She walked between the desks as she handed back the assignment. Everybody was supposed to be working – silent reading – but that was more about pretending to read as we tried to listen for her comments. A few words of encouragement, support or congratulations, said quietly and with kindness. Always with kindness. You could almost tell the mark by the reaction of the student – a smile or frown, a look of shock or surprise or upset. I waited impatiently. Being a ‘W’ always meant being toward the end. The only time that had any benefit was for vaccination needles and dental examinations and even then, wasn’t it better to get bad things over with? Not that this was going to be bad. I had the unshakeable confidence that grade 5 students often have. Besides, I was good at school and I’d spent a lot of time on this story and I really liked writing. It was long – almost twenty pages. If she just counted the pages or weighed it then it was ten times as good as everybody else’s story. And more than that I had done something else nobody had done. I’d taken my older sisters’ typewriter and with two fingers I’d typed out my story. It was called The Three Wolves which I, unfortunately typed as The Three Wolfes – and then corrected the title and the 56 times I’d misspelled in the story with a black pen. The important thing was that I’d fixed the mistake so she wouldn’t take off marks would she? My dream of an ‘A’ seemed in doubt. But still it was a good story. It was about three wolf cubs whose mother had been killed and their epic quest to survive. Looking back at the story years later I realized just how much of my own circumstances – the death of my mother – was embedded in that story. Miss Gay stopped beside my desk. She looked down and smiled. She often smiled. My best friend, and still friend, Augie Levy, said that she was the first teacher who never yelled at him. “Congratulations,” she said as she placed the paper on my desk. There on the top right corner in red pen was a big A+. I couldn’t believe it! “You know, Ricky, you could be a writer when you grow up,” she said. “Perhaps later you can read your story to the class,” she said. As she walked away I just hoped that I wasn’t the only one who had heard what she’d said to me. I particularly hoped that Carol, seated one row over and one seat back, had heard. I tilted the paper up high enough for the A+ to be seen by somebody seated one row back and one seat over, but not low enough so it looked like I was just reading it and not showing off. There are so many teachers in a line from kindergarten until the end of university who say so many things to us – good, bad, poignant, wise, and painful. Most are like water off a duck but others sink in. I grew up to become a social worker and a teacher. While teaching Grade 5 – strange how that was always my favorite grade to teach – I started to write stories for my students to encourage them to become more interested in reading and writing. That first story, set in my school with many of my students as characters, became my first published book. This started me down a path where I became a writer. I still have that story from Grade 5. It’s the only thing from my entire history as a student that I’d saved. More importantly, after a gap of thirty years, I still have that teacher in my life. She is now in her eighties, lives on her own, drives, travels the world, has a leading role in her church, and reads without glasses. Occasionally Augie and I take her out for lunch. What do you say to a person who not only gave you so much but continues to be a role model? Words sometimes aren’t enough. 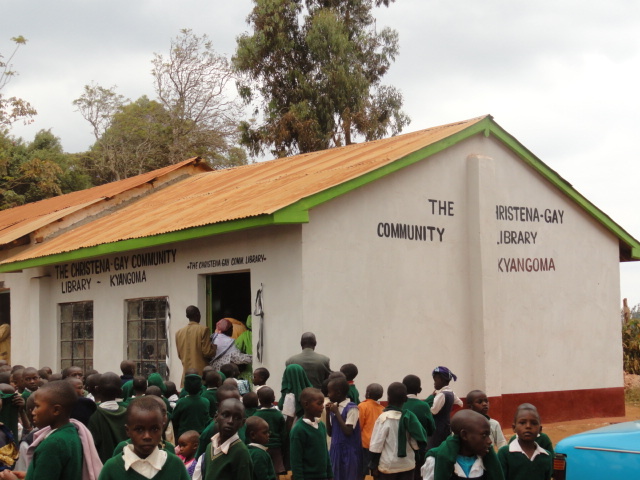 On July 29th, 2010 in the community of Kikima Kenya at Kyangoma School the first library in all of Mbooni District was opened. I cut the ribbon on the Christena Gay Community Library and opened up a world to those students, the way she opened up a world to me. She still calls me Rick or Ricky. I sometimes call her Chris, but Miss Gay seems so much more natural. So much more respectful. Thank you, Miss Gay. You’re the one who deserves the A+. In addition to opening the library we also dedicated Kate Stadium. 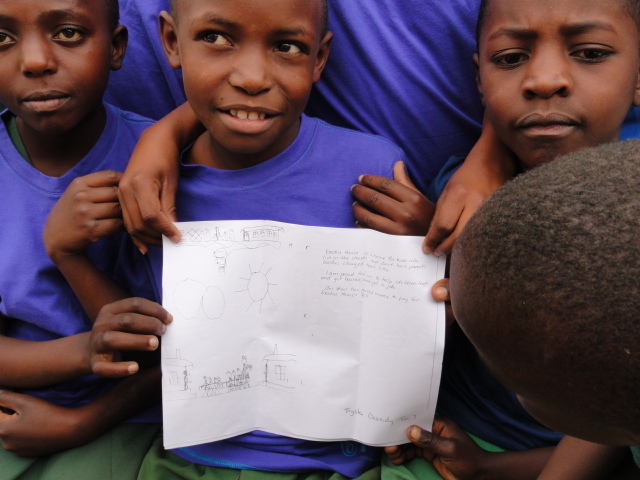 Kate spent two months as a volunteer in the program at taught at Kyangoma School. One of her assignments was physical education and she spent countless hours on the playing field. 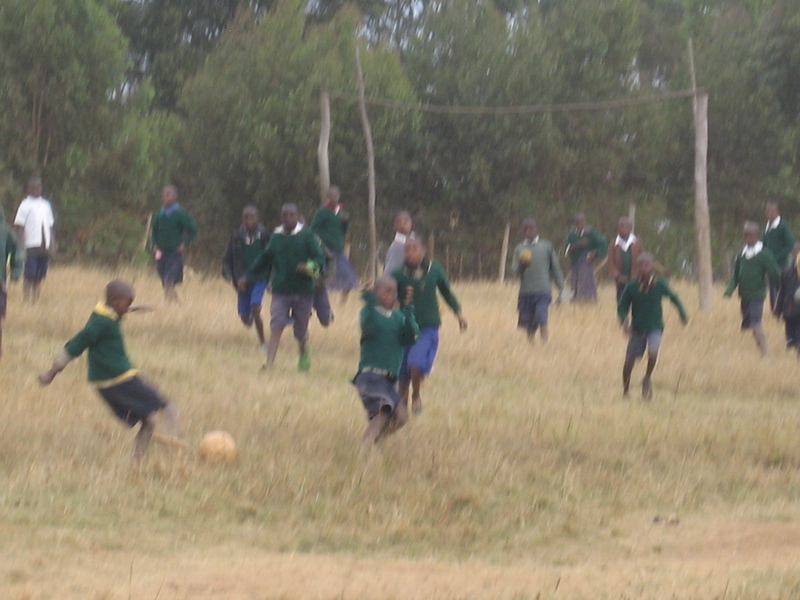 Everybody knows that Kenya produces the greatest distance runners but you have no idea why that might be until you run or play soccer at high elevation – twice up the field and you’re bent over breathing heavy and those kids just keep on running! We wanted to honour Kate and this was done with the installation of metal soccer poles (replacing warped, wooden tree branches), net ball poles and nets, and a flag pole. To ‘open’ the field we held a ‘football’ match – girls vs. boys with me playing on the girls’ side. I’m happy to report that it ended in a tie game with me bent over ‘sucking’ air. 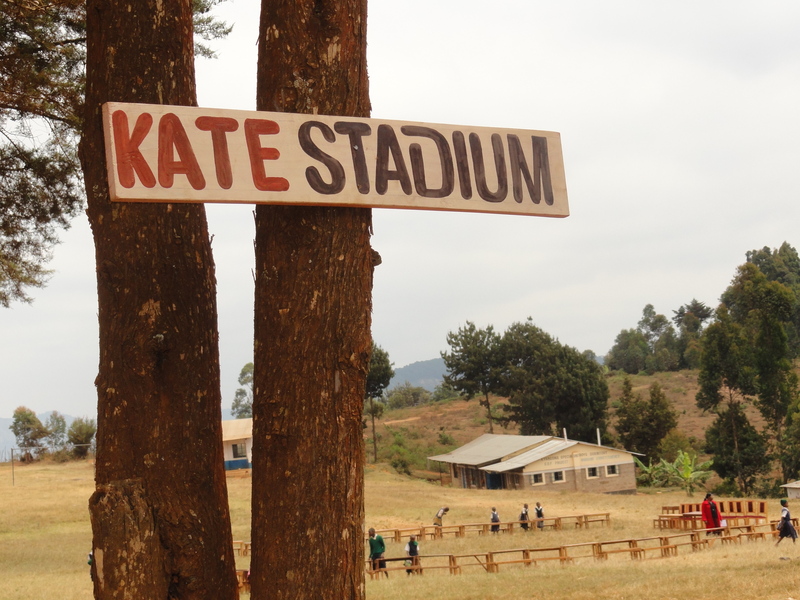 The kids of Kyangoma simply loved having Kate there and were thrilled with their new facilities. Long term plans/dreams call for her to return in the next year or so. Twenty-four of the twenty-six residents of Rolling Hills go to Kyangoma. In a country so filled with orphans, that they are often seen in a negative light, we have worked to make sure that our children are seen as a blessing. We have always tried to provide the school with things that benefit the entire school population. 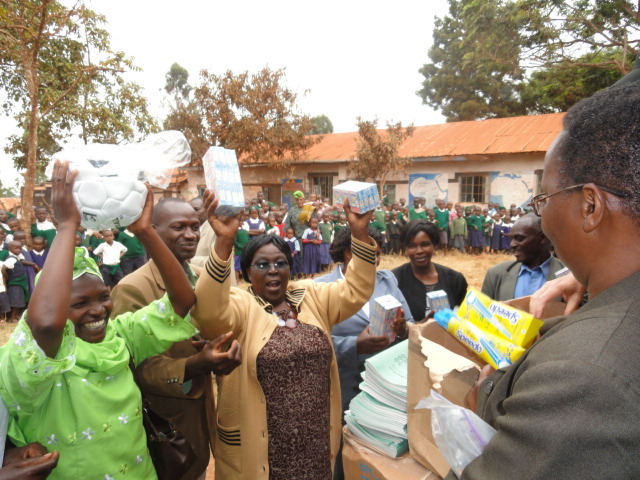 In addition to the library and stadium, part of the ceremony involved providing much needed supplies for the entire school. With funds from Fred and another sponsor, Sue VanNorman, plus additional funds we donated to Kyangoma a massive quantity of school exercise books, pencils, pens, erasers, chalk – enough to basically supply the needs of the students and teachers for the remainder of the school year. 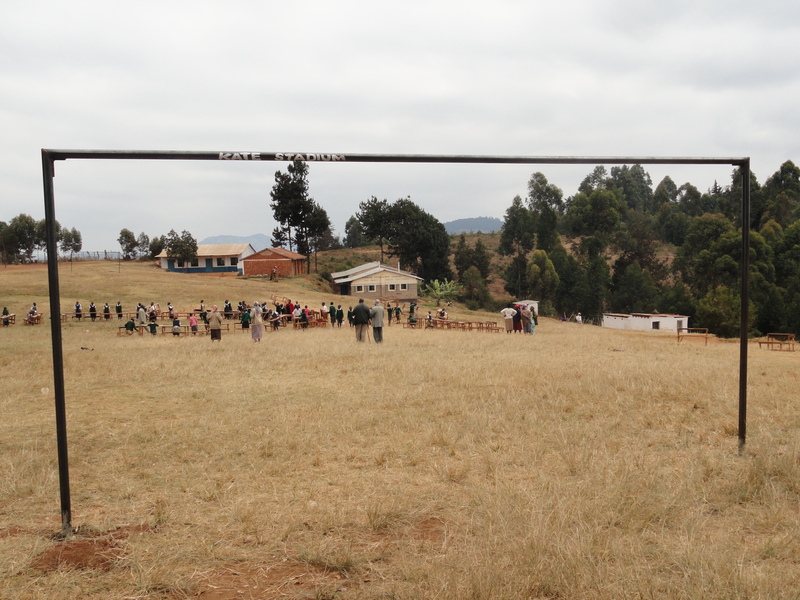 In addition we supplied the school with more soccer balls, netballs and volleyballs. 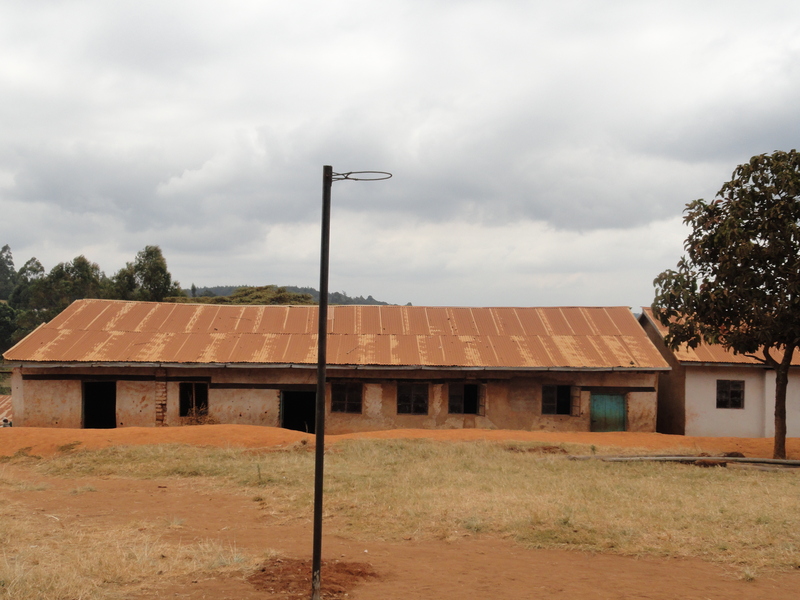 The principal bragged that they had more sports equipment than any school in all of Mbooni! The cheers from the students were exceeded only by the cheers of the teachers. They were so happy to get the resources they needed to properly teach their students. With water there is life. We have launched a number of water projects for the community that have made an impact on thousands of lives – providing fresh water for irrigation of crops, for livestock and for drinking and washing. This summer we decided that we needed to secure a safe, ongoing source of water for Rolling Hills Residence. We started to dig a well. In many places in the world digging a well involves the use of a drilling rig and high technology. 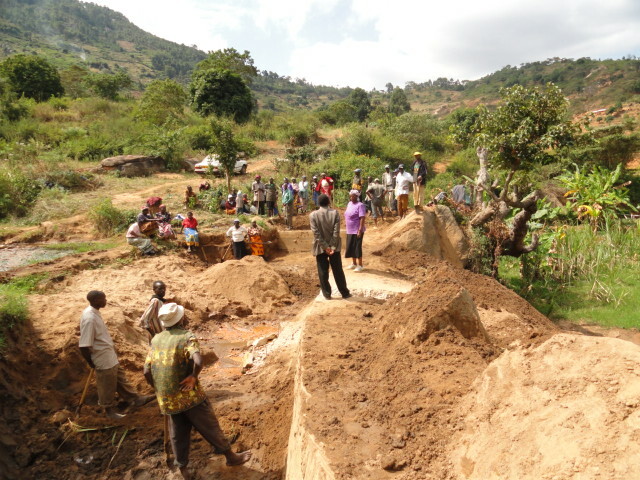 In Kikima it involves men with shovels, picks, buckets, chisels and sledge hammers. In June digging began. The hole, about two metres wide, was being dug by two people. One of them, who had completed Form 2 (Grade 10) was doing this so he could afford to go to school the next year. It was mesmerizing to watch these two at work. 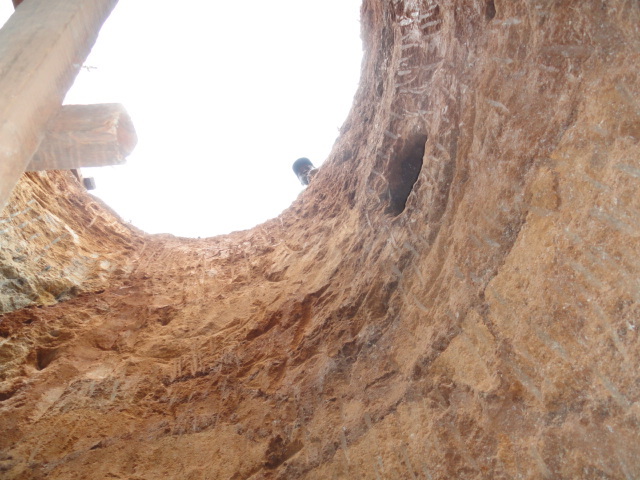 The first thirty feet – as deep as a three story building is high – was through clay and soil. That’s when they hit the first rock. Picture a rock the size of a car and you have a pretty good idea what they encountered. Using chisel and sledgehammer, breaking it into little pieces and then hauling it to the surface by bucket, they smashed through the rock and continued to go down. 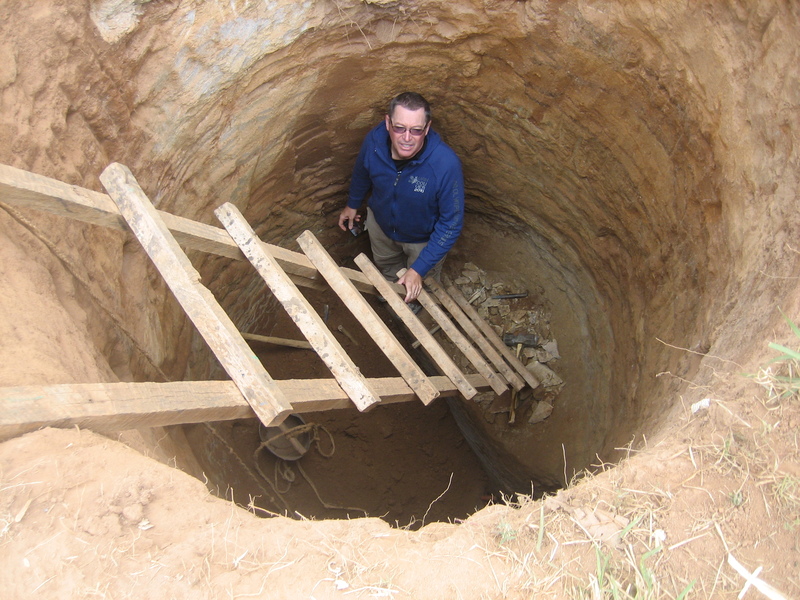 At this point I was there and went into the hole. It was, to say the least, a little eerie, to climb down the first part, watching the circle of blue sky at the top getting smaller and smaller. Hitting the first part down I got off the ladder and then went further down to the part where they were now beneath the rock. I had a thought about digging a shovel full of dirt – sort of symbolically ‘helping’ – but decided against it. These men – really a man and a boy of high school age – were doing the real work and for me to pretend to help just didn’t seem right. They kept digging, day after day, through soil, through more rocks, until finally, more than 60 days after they started digging, they hit water at the 67 foot mark. They continued another three feet, to an even 70 feet to ensure a sufficient quantity of water would flow. To picture that depth, think of a hole as deep as a seven story building is high. From that vantage point, using ladders or simply scaling the depth by climbing the side holding a rope, the sky above would have seemed so small. installing a pump and then topping the whole thing off with a lid. This will take at least another month, but when it’s all done the children of Rolling Hills Residence will have a guaranteed, safe, source of water – water that will fuel their ongoing journey to responsible adulthood. I also wanted to provide an update on two projects. The project funded by Ryan Rumsby’s class has continued to evolve. We met with the community team responsible for it being built and maintained. They have made two changes, two improvements that have made the original well even better. Plastic piping has been used to bring the water further away from the concrete base so that the continually running water does not cause any deterioration in the concrete and stepping stones and concrete have created a set of steps to allow better access to the water. 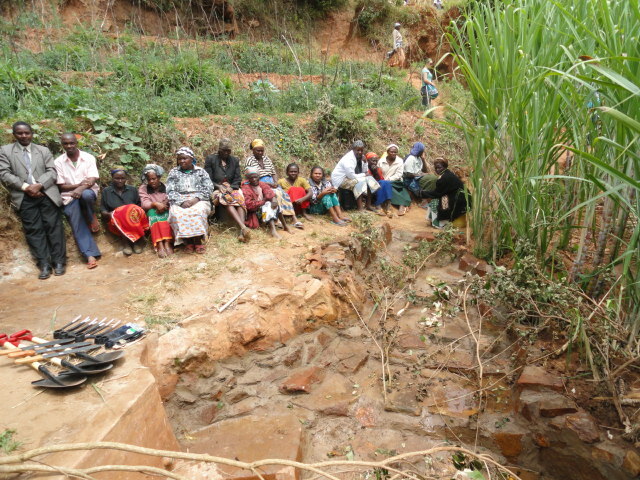 The community members are proud partners, grateful for the funds which have been provided, who take pride in maintaining and improving this water source that has meant so much to hundreds of families. You’ll notice in the picture to the right – the one showing the stairs – there is also an assortment of tools. We donated this to the community committee to help with the ongoing care of the project. 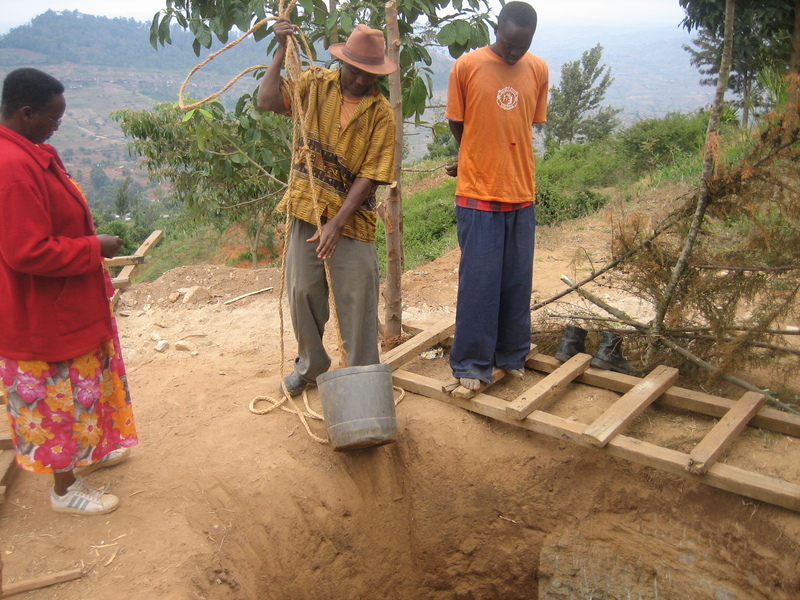 What I also discovered on this trip was that the land for this well was donated to the community by the amazing Mr. Kieko who leads so many projects aside from being the Chair of the Creation of Hope program in Mbooni. He is an example of a caring man trying to help his community. 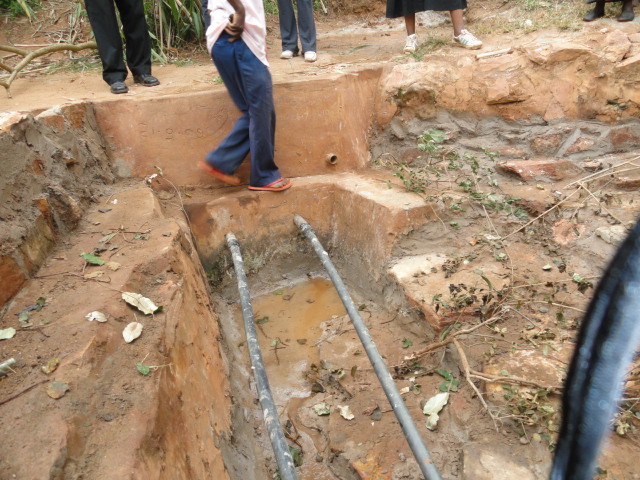 The second water project suffered some setbacks during the last rainy season. The rains were much greater than usual and the erosion of soil filled up the entire space behind the wall – three feet high, two feet thick and twenty feet long – became completely filled with mud and soil – basically cancelling its very purpose! It could no longer hold water from the spring! The local committee, the people who planned and worked on this project, sprang into action. More than thirty people with shovels and hoes, started digging. It took four full days – one day a week for a month – for the committee to excavate the site. They decided not just to dig it to the same depth and size but to make it deeper and wider and longer. A solution was found. The middle of the dam was “cracked open” to create a gap. 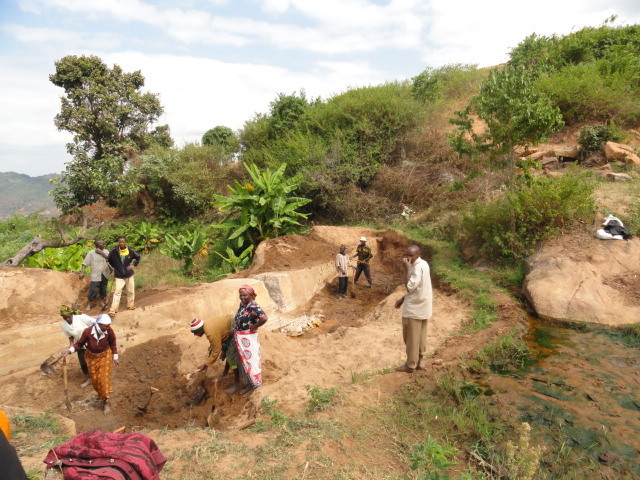 In the coming weeks this gap will be blocked by a gate which will be opened during the rainy season – so the soil won’t accumulate – and sealed up the rest of the year to pool the water from the spring. Things are not always going to go right with a project – at least not the first time. But by involving the community, by the community having ownership of the project, when problems develop, solutions will follow. The people of that community – our partners – gave thanks to me to pass back on to you. 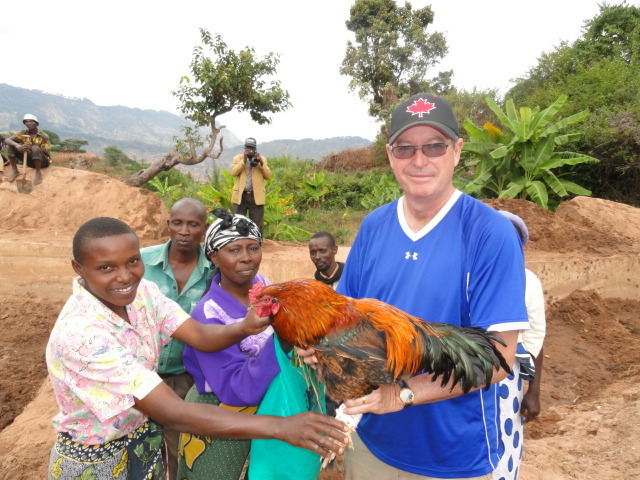 They also gave me a rooster, perhaps the most beautiful rooster I have ever seen. He is now the official rooster of Rolling Hills Residence, protecting the chickens and doing his part for the kids to have fresh eggs. As part of my trip I met with the people of three communities in which new water projects have been suggested. These meetings, in the place where the project would happen, are a combination of formal and informal with an agreed meeting with some people and others, simply coming to get water, joining in on the meeting. When Rolling Hills Residence was built it was conceived that it would hold 16 children. It presently has 26, but with a knowledge that there are so many others in need of care. As always we try to keep children in the homes of caring relatives – grandparents, aunts and uncles, etc – but when there are no other alternatives we look at the child coming to stay at our residence. Always we work to maintain contact, often weekly, with their extended families, and we never take guardianship – this always remains with the extended family. We have made plans for an ambitious extension. It will have three levels, descending down the hill. 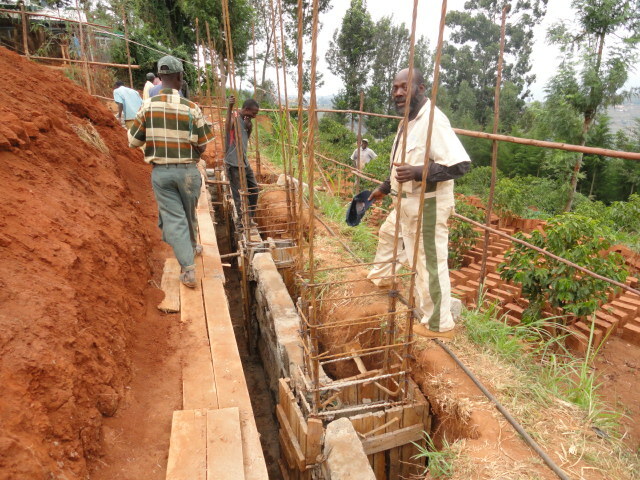 The lower level will be the boys’ dorm, the middle level the girls’ dorm, and the top level will be the dining hall, work area, and an office for the entire outreach part of The Creation of Hope. The foundation for the entire structure is being dug and built and then we will start with finishing the bottom section first. Working on the site, are up to 35 people. They are employed by the stonemason who is the contractor for the project. Each man – and some are boys raising funds to continue their high school education – are paid a living wage. This is by community standards sufficient to pay rent, buy food and clothing and pay for education. It is important to realize how these salaries ‘ripple’ into the whole community. With these salaries the men buy supplies, expand their houses, pay for the education of their children, purchase things from the market, and buy tools and seed to expand their farms. There is, as often is the case with our projects, a very personal touch to this expansion. The first phase, the first wing of the new building is being called Diana’s Wing. This is a request of the students and staff of Rolling Hills Public School, which remains our greatest supporter. Diana was a teacher at their school, whose life was tragically cut short, but whose actions and memory remains very much alive. 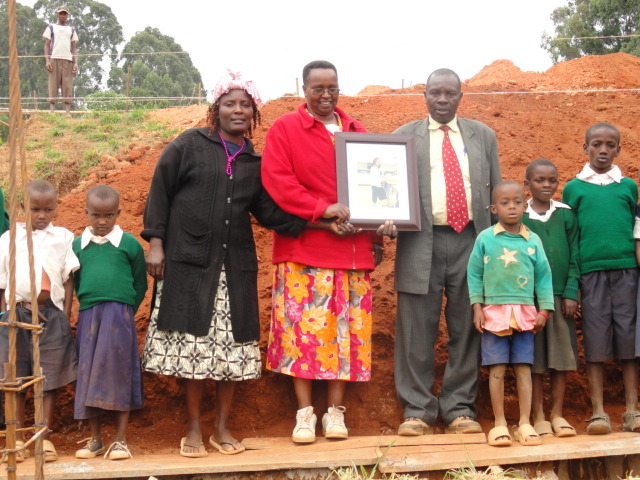 We all assembled on the construction site and the picture – to be mounted in the new building – was passed from child to child, a symbolic gesture, while I explained the significance of this person in the lives of children in Canada and they came to understand the significance her life will have in their lives. Bricks for the home and for the well are purchased but also manufactured on site. 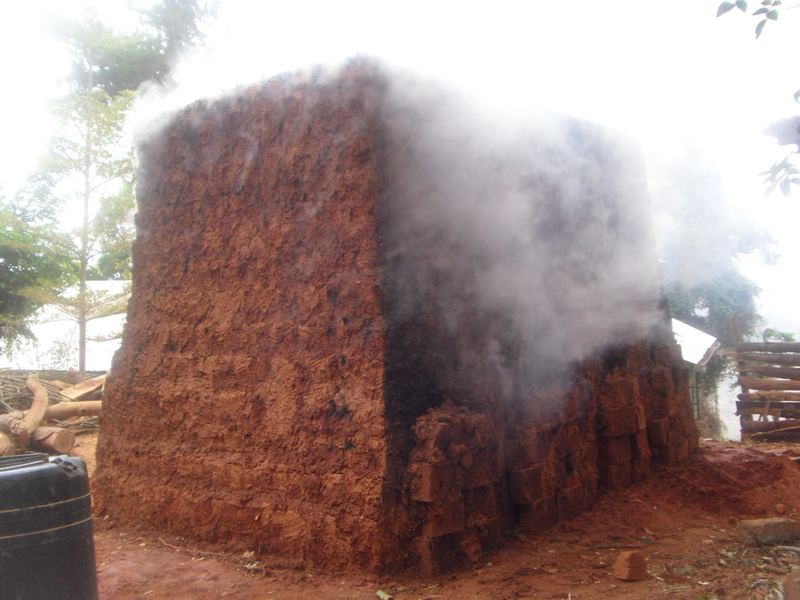 The clay is mixed with water, placed in a form, dried in the sun, and then the bricks are piled up to form their own kiln and ‘fired’ until they become completely hardened. Below are the last two steps in the process. Once per month there is a food distribution day for all of the children sponsored by our program. Originally this took place every second week but we found there was more efficiency in giving up twice as much food, half as often, based on the organization and the cost of providing transportation for families who are travelling up to twenty kilometres each way. I was there for the most recent event, joining over two hundred people from across Mbooni, including the orphans, their extended families and concerned members of the community. In difficult times these food distributions have meant not only the difference between being fed and being hungry, but simply being alive. In addition to the food being given out, there were other needy children and families who were presented with gifts of blankets and tools. 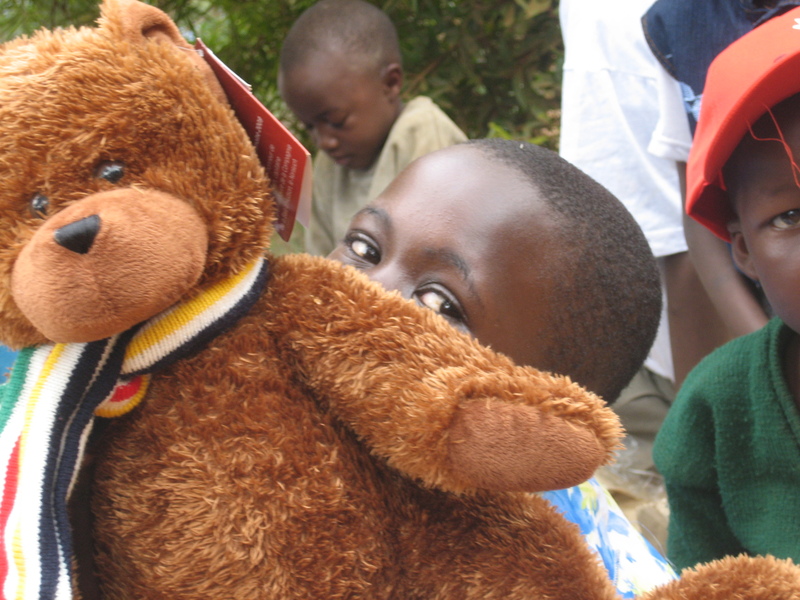 Twenty-three blankets were distributed between that day and at local schools. 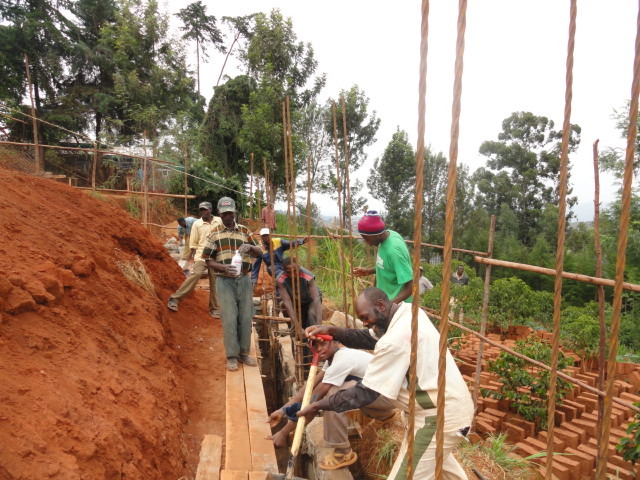 Sixteen sets of tools were distributed that day and at the sites of the two water projects. We also distributed presents to the 67 sponsored children in the program. These included items sent by their sponsors and items purchased in the local market. We wanted each child to receive something special and these bags were filled with school supplies, soccer balls, stuffed animals, small toys, clothing and personal items. 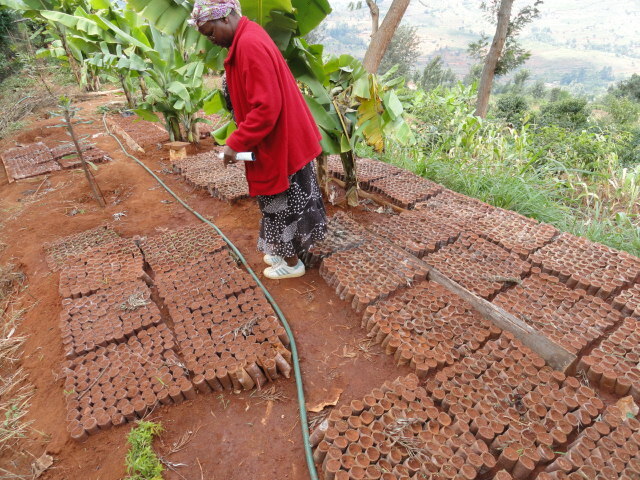 We continue to grow saplings and distribute these throughout Kikima. 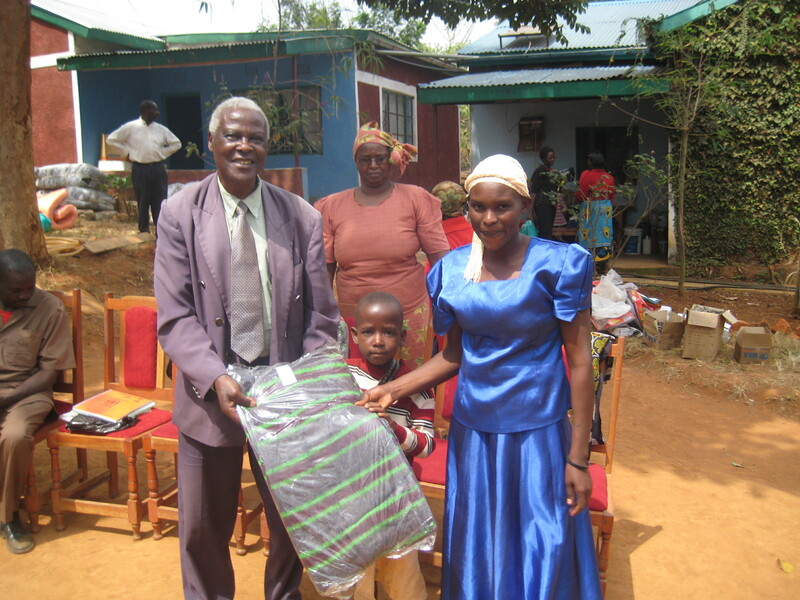 During the summer 50 blankets ($5.00 per blanket for a total of $250.00) were purchased and given out to needy orphans. 20 of these blankets were funded by Stanley Park Senior Public School in Kitchener. 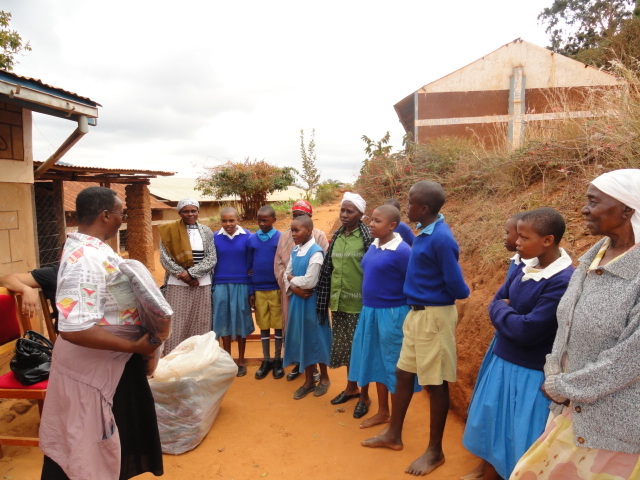 10 blankets were funded by money donated by Luke Yamasaki of St. Mary’s International School in Tokyo. 10 blankets were funded by Alexander Graham Bell School in Ajax. The final 10 blankets were funded by money raised at Eastdale Seconday School in Oshawa. While school is ‘free’ until the end of grade 8 in Kenya, you cannot attend school without a uniform. 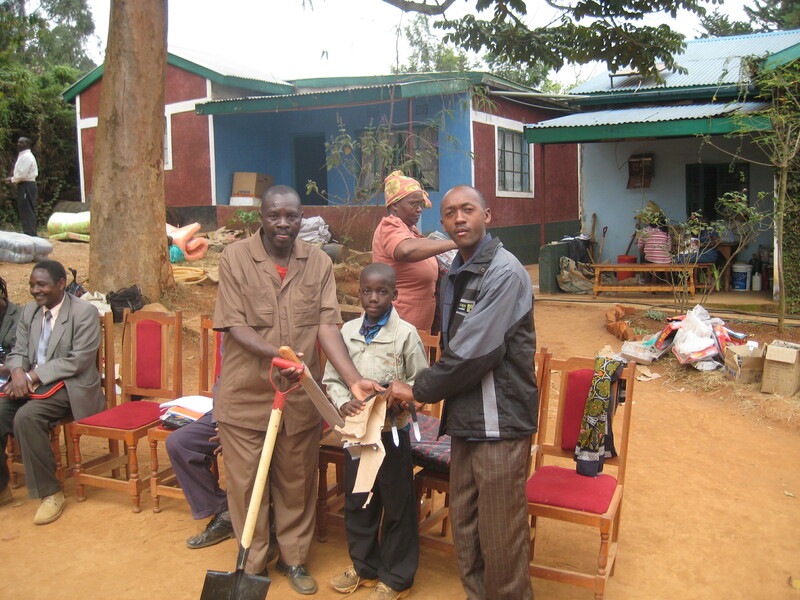 26 school uniforms were made at a cost of $12.00 per uniform and given out to children in the community. 10 of these uniforms were funded by Stanley Park Senior Park. 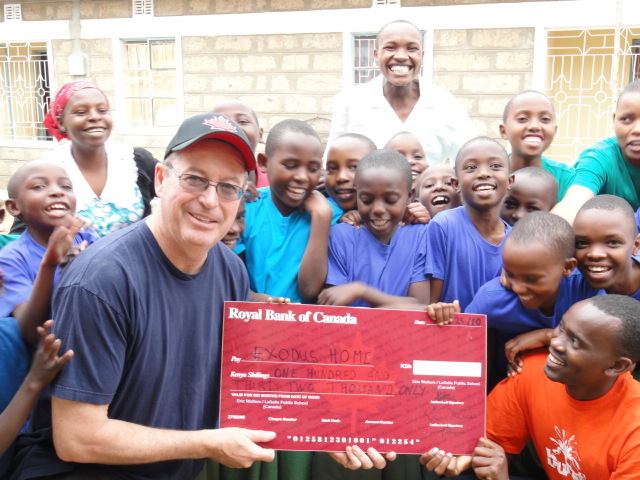 The money, $192.00, for the remaining 16 uniforms was provided by Eastdale Secondary School. The remaining $8.00 from the money donated by Eastdale was used for more saplings. During the summer 20 sets of tools were distributed. These were given to individual families but also 4 sets each were distributed at the two water projects to help keep the projects alive and vital. Tool sets (machete, shovel, digging tool, digging fork) are worth $17.00 (up from $16.00). Sixteen sets of tools were funded by Stanley Park for a total of $263.00. Along with money previously spent on chickens and a goat for William, this designates the total funds donated by Stanley Park. The remaining four sets of tools were funded with $68.00 raised by Medicine Hat High. The school donated an abandoned room for us to convert to a library. We had to plaster, paint (inside and out), put in a metal door with a lock, put in new windows with bars, a counter, desk, shelves and fix the roof. The total cost was $1995.00. $300 was provided by Glengrove Public School in Pickering, $500.00 from Cupar in Saskatchewan, $500.00 from Robert Southey in Saskatchewan, $534.72 from Westside Secondary School and $157.28.00 from Medicine Hat High School. As always, Ruth provided an itemized breakdown of the costs that detailed every expense down to the cost of nails, the padlock for the door, paint, bricks, labour etc. It is important for the project to be able to demonstrate complete transparency in every aspect. 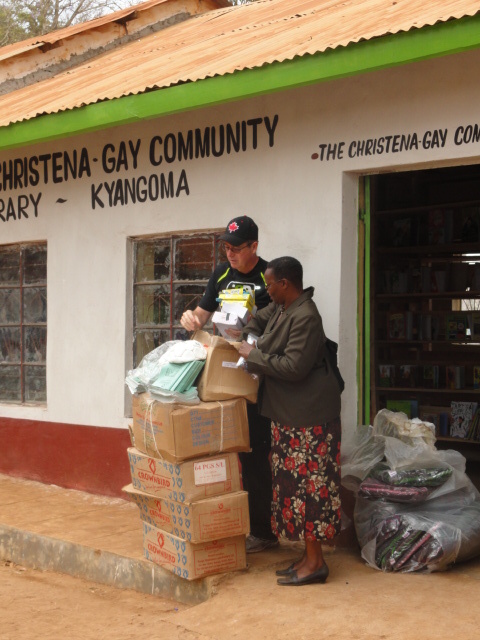 The books that were purchased for the Christena Gay Library cost $995.68. We used $495.68 of the money donated by Ray Lewis Elementary School in Hamilton. Previously we had used $500 for general school supplies from the money they had raised. The additional $500.00 for books was funded by money donated by Stride Community Library ($300.00) and Smithfield Middle School ($200.00). This well is the life-blood of our entire project. It will provide water for all the needs of the orphans; washing, cooking, for the goats and chickens, and watering the plants that they raise. It is also going to be used to provide the water to irrigate Henry and Ruth’s farm and water will be offered to surrounding properties – as a courtesy – if it is available. 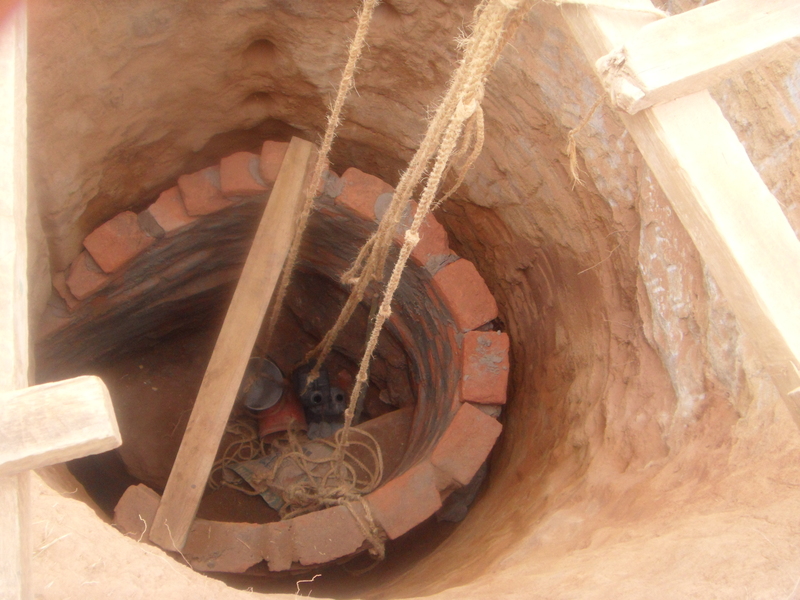 The final cost for this well includes the following; digging and construction labour ($1138.46), cement ($209.23), bricks ($700.00), hoses and piping ($350.00), and a pump ($538.46), for a total cost of $2938.15. $1000.00 of this money is from funds raised by Kyla and Lorelle, two incredible students at Rolling Hills. $438.15 is from funds raised by Fairview Public School students in Mississauga. The remaining $1500.00 was donated by the Dawber family. As you read through these updates you’ll notice the Dawber family members coming up repeatedly. 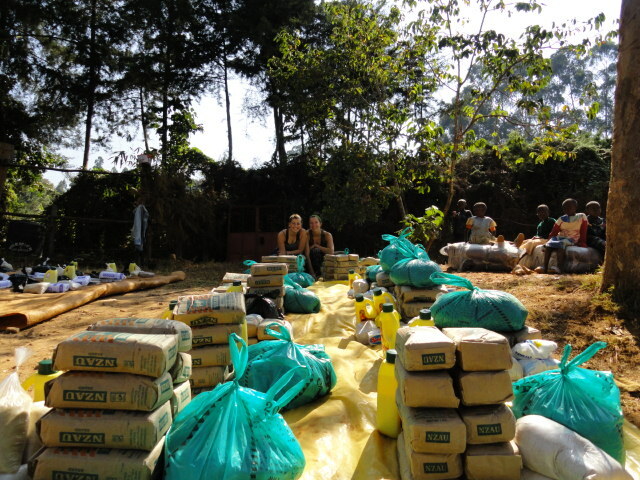 Aside from Kate spending two months in Kikima as a volunteer, and the family sponsoring 4 children, they continually make donations for specific things as well as giving money that allows us to place in general funds. The Dawber family is one of the cornerstones of our entire program. In light of this we have decided to dedicate the Rolling Hills well to the Dawber Family. In the coming months a plaque, to honour them, will be placed on the well. 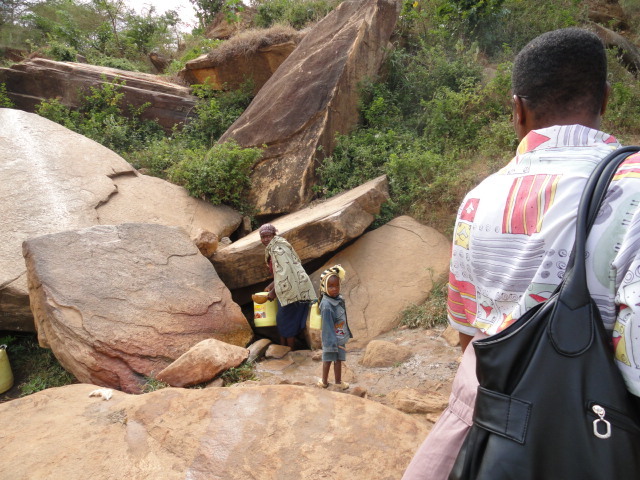 Up until three years ago there was no electricity available in the Kikima region. All electricity was either from batteries or generators and there were a few – very few – solar installations. Two and a half years ago the government brought electricity to the market area for stores and businesses and factories. This past year they extended the lines out of town including along a road close enough for The Rolling Hills Residence to get onto ‘the grid’. While we will continue to use our solar panels as a primary source of free power we felt we should get connected. The fee for connecting – putting in poles and running wire – was $692.00. This entire sum of money was paid by P.W. Kaiser High School in Fort Smith, NWT. With this power we can now run not only lights, but computers, small machinery (including a stove), and we have plans to get both a TV and DVD player for the residents. This will allow these children, most of whom have never travelled more than 60 kilometres from their homes, to experience the world through educational videos, to become more fluent speakers of English, to learn better skills. This will be, foremost, a vehicle for education and advancement. In the meantime we have been using a generator to provide additional electrical needs. The cost of gasoline for this for the summer was $197.00 – funds provided from Glengrove P.S. The cost of firewood (warmth and all meals cooked in a wood burning stove) for the three month period was $187.00. This was provided by Glengrove ($56.47) and Ray Lewis ($130.53). 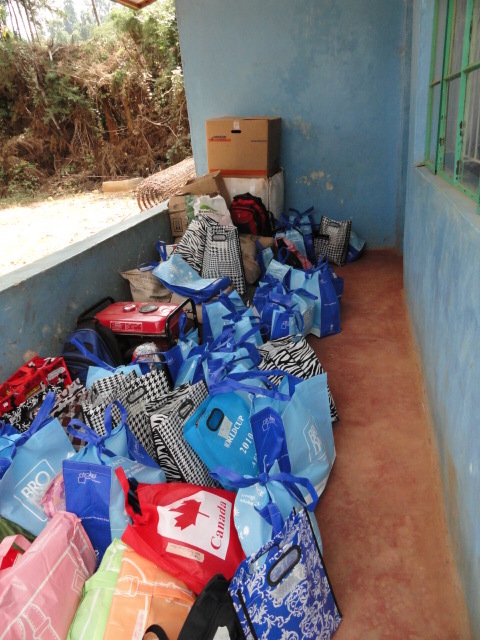 More than $1500.00 was spent on supplies for the school where our children attend. This is for the benefit of all the children at the school. This money was donated by Fred Dawber and Susan Van Norman. It’s often difficult at a casual glance to tell boys from girls in a picture because all children have their hair cut down with a razor cut. The cost of doing this was $18.00 for the summer months and was provided by Fairview funds. We continue to offer workshops to students in the community. The cost of food, transportation and guest speakers in the summer workshops was $161.00 and this was funded from money donated by Cupar. A future workshop will be offered for Rolling Hills residents, children in the outreach program and their siblings, children of Exodus and the other children of the school and will feature some proud Kenyans including a doctor, a lawyer and one of the leading advocates of anti-corruption legislation in all of Africa! I wish I could attend this workshop which will focus the road to these careers and what is needed and expected to pursue such careers. School remains ‘free’ in Kenya up until the end of Grade 8. However, free has some limitations. 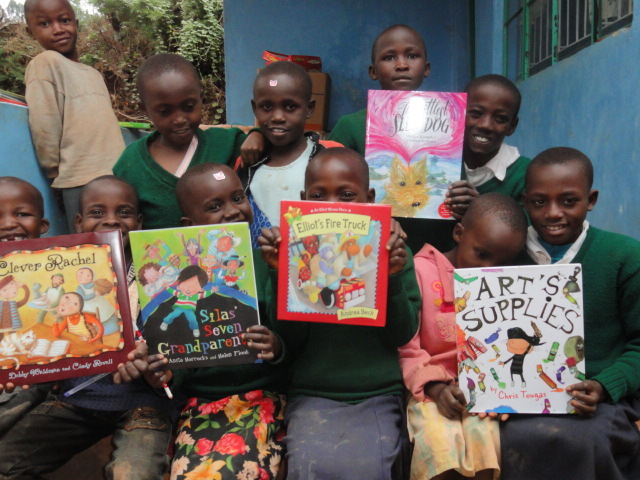 The children are still required to provide text books, school supplies, the cost of tests for higher level students hoping to go on to high school, and every child must pay twice yearly school fees. The last instalment for the 26 children in our program was for $213.00 . This was provided by a donation from Carruthers Creek Public School in Ajax. Nursery school is not free. Further, no child can enter Grade 1 until he or she has completed nursery school. Two of our children are in nursery school. Their fees this semester are $83.00. These funds were taken from money raised by Shelly Hlaki, a parent at LaSalle Public school. In addition her money was used to pay for thirteen blankets that were distributed to orphans in the community, with the final two dollars of the money she raised going to the sapling nursery. 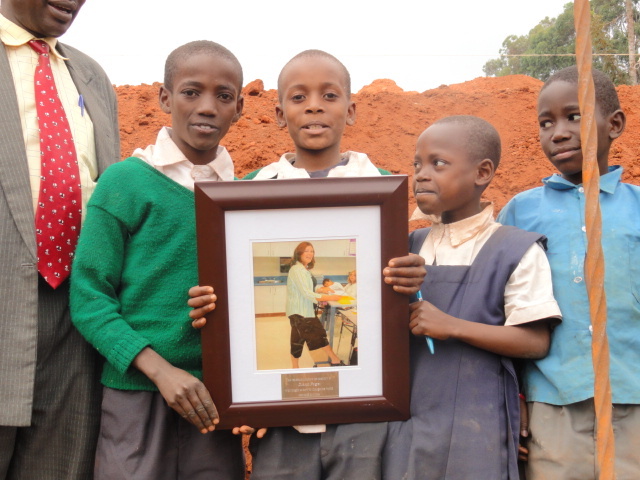 Faith Nthenge is a young girl who is in Grade 10 at the school where Lisa taught last year. 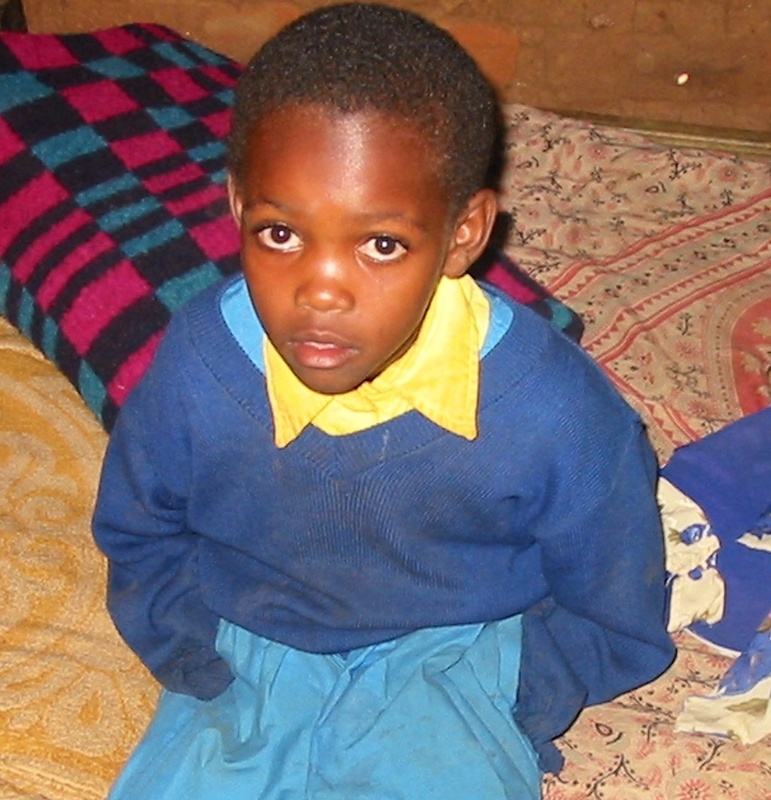 She was on the verge of having to leave school because her family could not afford the fees. The Creation of Hope paid for her Grade 9 fees. She remains a dedicated student who could not afford ongoing fees so once again we have provided those fees. The total this year for tuition, room and board, school tests, texts, and school uniforms is $310.00. This was provided by funds raised by Erindale Secondary School. We are so fortunate in this country to have free medical treatment. This is not the case in Kenya. Each time a child needs to see a doctor, for anything minor or serious, we must pay a fee. With twenty-six children in our home and others in the outreach program this is an ongoing expense. When I was present in July two of the children had to be brought for medical treatment – one for a severe headache and the other for an ear infection. Treatment for parasites, such as ring worm, is an ongoing concern both in the home, with our children in the homes of extended family members and with children in the community. Common ailments include typhoid, malaria, amoeba, earache and ring worms. For the period of March – August the amount of total medical services was $1665.00. While this served literally hundreds of children, more than half of this cost was for one child. She needed extensive medical examination, assessment, and ongoing treatment. All of these funds were provided by money raised by Highland Secondary School. These funds have greatly increased the ongoing health of children, but have also directly saved the life of one girl. It is not just children who need medical attention. Our goats at the goat academy, brought up to Kikima from lower areas, have found that ‘winter’ has been rough on them. We have had to pay vet fees for coughs and colds, as well as worms. There is also the cost of herding the goats and some addition feed costs. All of this was a cost of $207.00 – thanks Fairview kids for taking care of our goats! Serah is responsible for 26 children. She lives in the residence and provides for the 26 children who call Rolling Hills their home. She also has four children of her own. The oldest, Denis, is in high school while the three younger live with Serah’s family and go to elementary school. In addition to her salary we provide school fees for her children. With the expansion being built we have offered to Serah the opportunity to have her three youngest children join her at the residence. This is an exciting development for her, her children and for the 26 children of Rolling Hills. With each addition to the residence the children simple look forward to another ‘brother or sister’ joining the family. Through the first months of the program, when there were less children, Serah’s salary was $60.00 per month. This was with an expectation that eventually there would be 16 residents. There are now 26. We decided to adjust her salary to reflect the work that she is doing. She now receives $100.00 per month. The salary for June, July and August was provided with a $200.00 donation from Erindale, and $100.00 from Glengrove P.S. Kikima is a relatively safe place. I feel comfortable walking the dusty roads at almost any time and certainly did not feel any concern with Julia and Megan walking the 3 kilometres to and from school each day as well as going up to the town and market. However there is a need for security, especially at night. Our night watchman – they call him their ‘soldier’ walks the grounds from six in the evening to six in the morning. At that time he returns to his farm – where he lives with his wife and young child in the compound of his father – sleeps, and then works at his farm. He walks the grounds armed with a bow and arrows – the traditional Kamba weapons. In addition he now carries a machete and club and is wearing a very, very warm winter jacket – it does get cold at night. His coat cost $15.00 and came from Ray Lewis funds. His salary is $45.00 per month. While he has been employed for the past five months we have never attached is salary to a school. His salary or $225.00 (April, May, June, July and August) was paid for by money donated by Carruthers Creek ($187.00), Smithfield ($28) and Ray Lewis ($10). Many of our children, prior to entering Rolling Hills, were in situations where their ability to attend school regularly was not possible. Further, some of those who did attend were deprived of food, rest, and health. Often they enter our facility doing poorly in school. We decided that they needed additional help. A tutor attends the residence 4 times per week. In the afternoon she works with the junior children and nursery children. In the early evening she spends time tutoring our older children, preparing them for the tests that will determine if they are able to go to high school, the type of school, and ultimately determining their future careers. Her salary for the year from January until the end of August has been a total of $236.00, which was provided by Ray Lewis funds. It is of special note that more than two thirds of our children are now in the top 4 students in their classes now! Each month we give out more food than the money we receive in sponsorship. This is reflective of our efforts to continue to support the extended families of children who are in the residence and the large number of children in some homes. A sponsored child is provided with food that will not just provide for them but sufficient quantities that other orphans in the home are also supported. 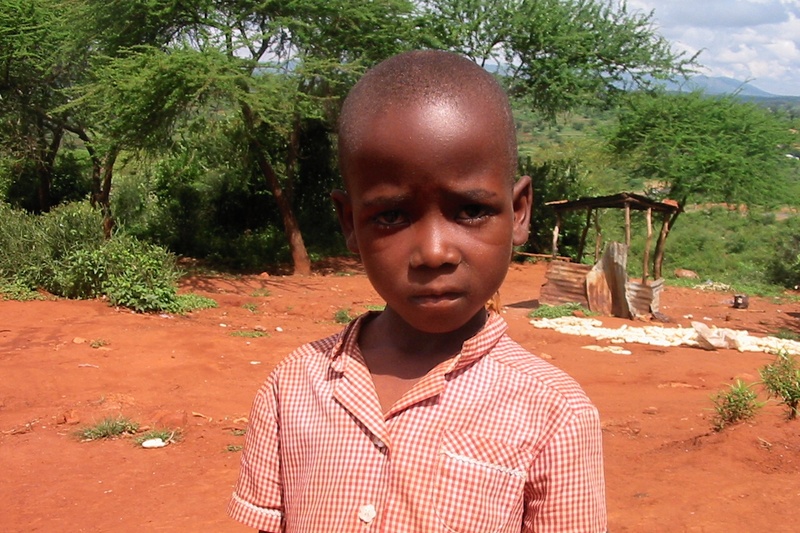 For example, Benjamin is one of six children in the home being cared for by his grandmother. 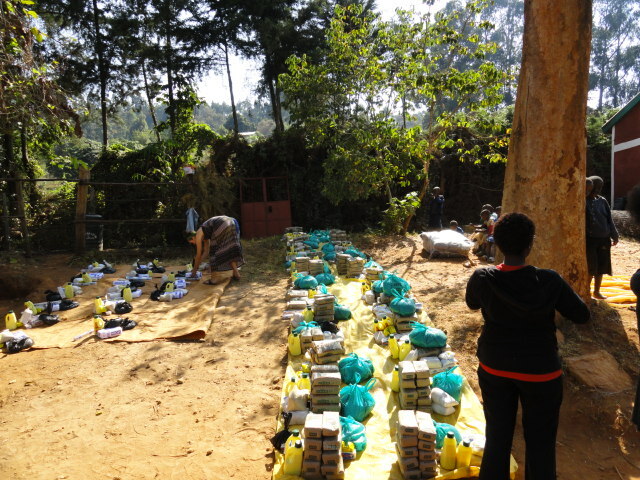 Food given to Benjamin helps to feed all six of the orphans. In June we had a $125.00 shortfall, July $115.00 and August $115.00. These amounts were funded from money donated by Innisdale Secondary School in Barrie. Some of the orphans and their extended families are coming 20 kilometres – each direction – to get to the food distribution. We decided that we would provide transportation by bus or motorcycle taxis to get them to and from the distribution. Over the past 5 months this has come to a cost of $395.00. These funds were from money donated by Robert Southey. We do extensive communications via internet and an occasional phone call, as well Skype sessions with schools. Our ‘air time’ over this period has been $192.00 and we’ve designated funds donated by P.W. Kaeser H.S. All of the money donated by LaSalle Public School was used to pay the rent for Exodus for one year – from June 2010 until June 2011 – to purchase a computer and printer for Exodus for their ongoing use including the ability to have increased contact between LaSalle students and Exodus residents, and to help offset the cost of ‘air time’ to allow this communication to take place. Letters from LaSalle for the Exodus children. Rolling Hills now has two new computers. One was donated by Fred Dawber and the second was purchased with funds raised by Highland Secondary School, which cost $361.00. 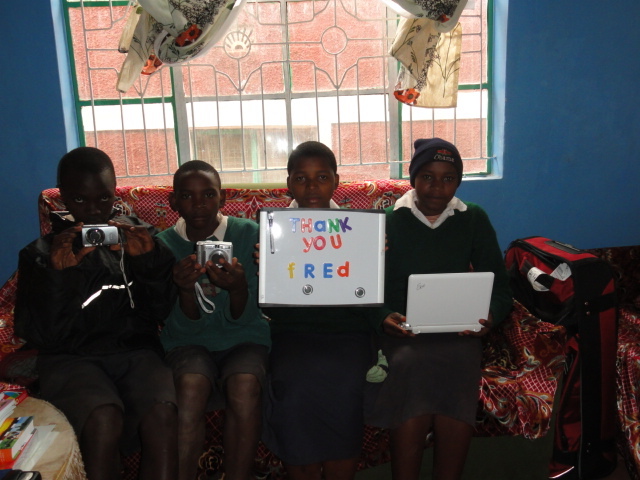 You’ll also note the two digital cameras which were also donated by Fred. Pictures – providing people with the ‘proof’ of what we’re doing with their money is worth thousands of words. This is the most ambitious project ever undertaken by our organization. It is a three-level building that will ultimately cost around $35,000 to construct but will provide the home to up to 40 orphans as well as the office space/classroom space to run the entire outreach program and provide workshops in the community. Here is a breakdown of construction costs, to date, and the schools that provided the funds. Bricks: 4242 bricks have either been made or purchased. The cost of these bricks was $834.00. This was provided by funds from P.W. Kaeser ($324.00) and Westside ($510.00). Sand and gravel and delivery charges for materials cost $1123.00. This cost was covered by money from Fairview ($500.00) and Cupar ($623.00). Water: Construction cannot proceed without water. With our water tanks running dry and the well not yet completed we were forced to purchase water – which was also used for the day to day needs of the orphans. With the final completion of the well, this will NEVER be necessary again. The cost of water was $714.00. This was funded from money from Fairview ($357) and Ray Lewis ($357). Timber, posts, beams, crossbeams; $1404.00. Fairview provided $305.77, Innisdale provided $400.00 and the remaining $698.23 from funds donated by Highland. Cement; $2892.00; Westside ($1055.28), Innisdale ($410.58), Ray Lewis ($579.44), and Highland ($846.70). Building blocks, stones, reinforcement rods, ballast, and assorted ‘other’ construction materials; $7962.00. All of these funds were provided by Rolling Hills. Labour costs; $3967.00. This has been designated as coming from the following schools, Highland ($1000.00), Cupar ($1000.00), Robert Southey ($1000.00) and Rolling Hills ($967.00). As the expansion construction continues some of these funds will be allocated and spent. We are however, going to keep some funds in the bank to cover the unexpected, such as medical expenses, and keep funds available for the costs of high school tuition fees which will come due in January. Please keep looking at our updates each month to see how and where our funds are coming from and being spent. With great thanks, blurry eyes and a warm calculator, that is the end of the summer update!